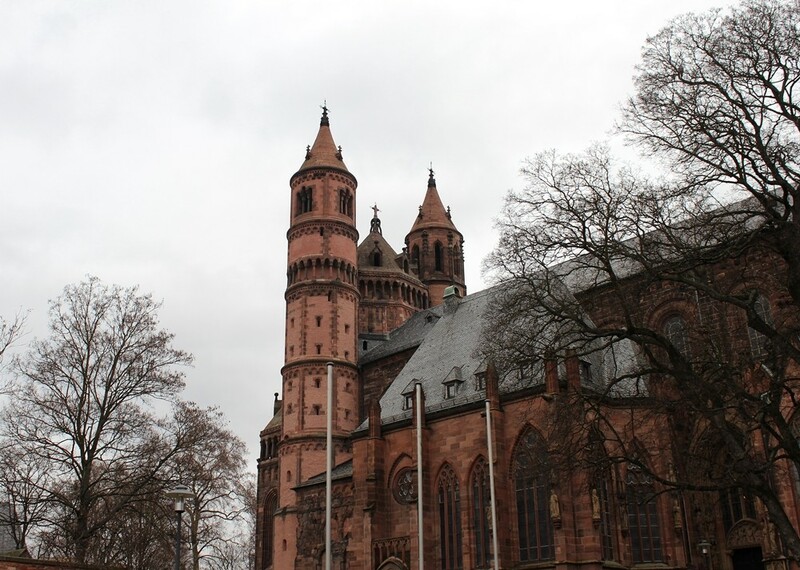 Feeling a bit touristy today I decided to visit the cathedral in Worms - one of the oldest in Germany. 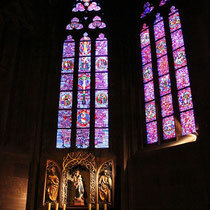 The light inside the cathedral is kept at a minimal level, as is appropriate for a house of prayer, therefore some pictures have a high level of noise. 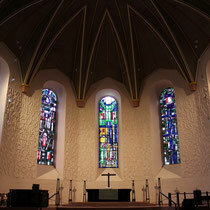 I apologize for that, but my main concern was to show the splendor of the interior. 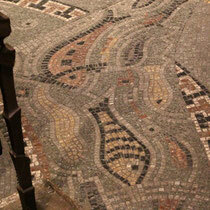 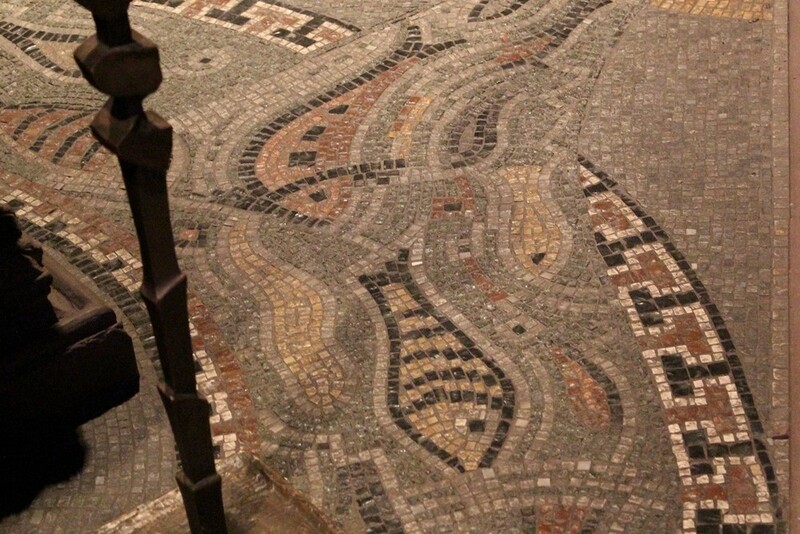 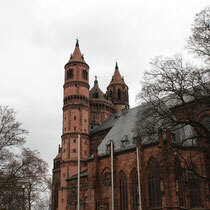 "The origins of Worms Cathedral go back to early Christian times. 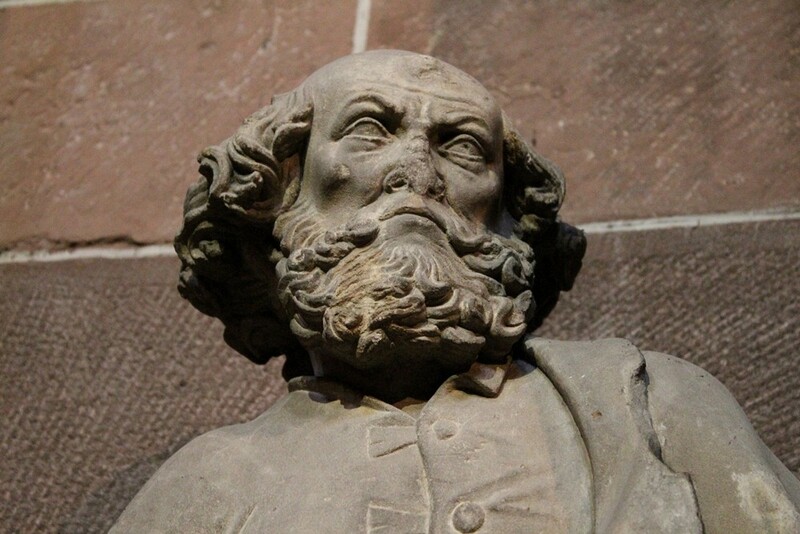 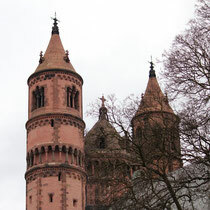 The first Bishop of Worms was Berthulf, in 614 AD; his cathedral was much smaller than the present one. 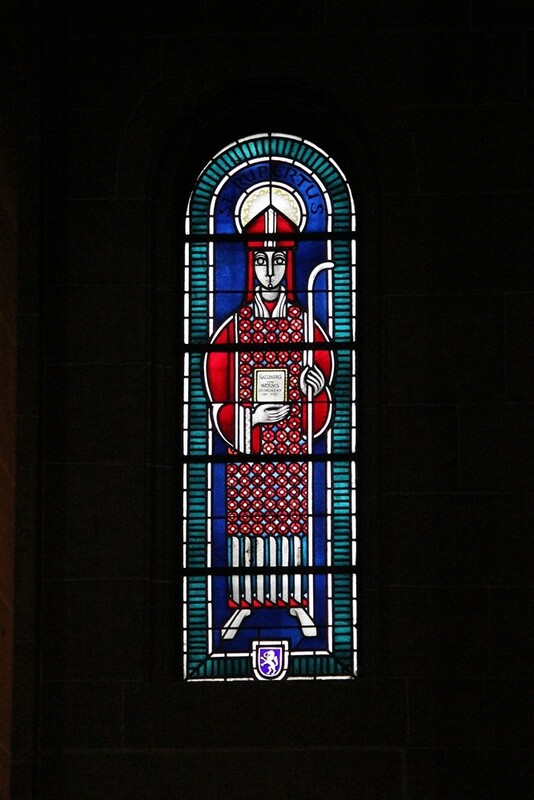 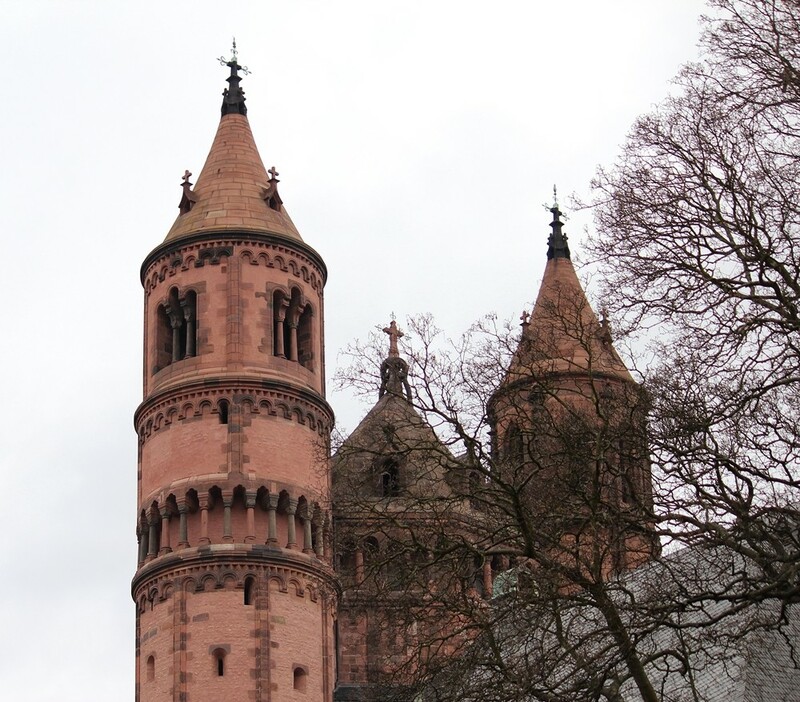 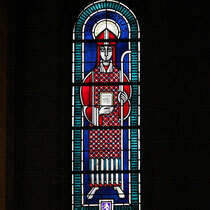 Under Burchard (1000-25), the most notable Bishop of Worms, a new Romanesque cathedral was built on the site. 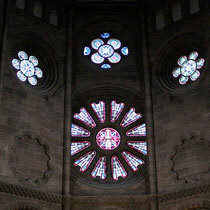 It had similar measurements to today's cathedral and some of the original parts survive. 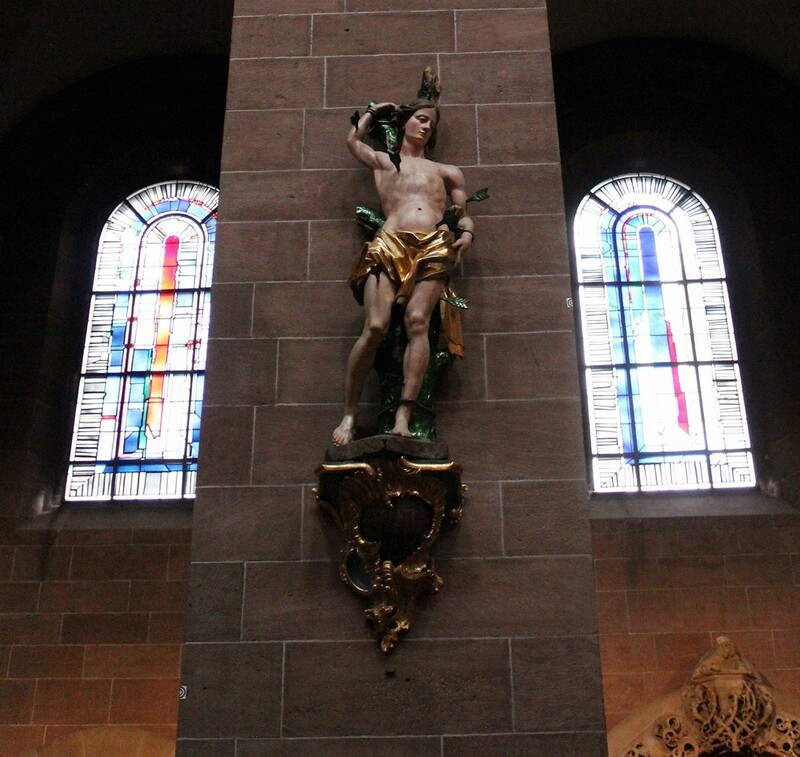 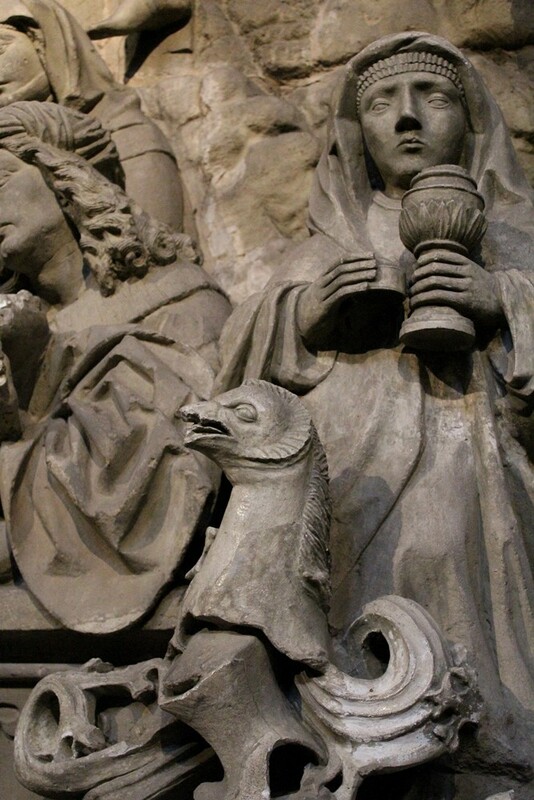 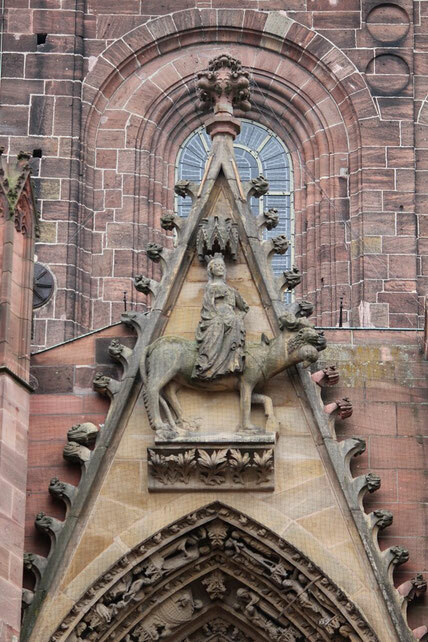 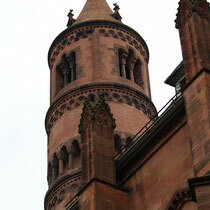 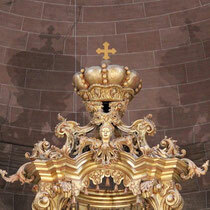 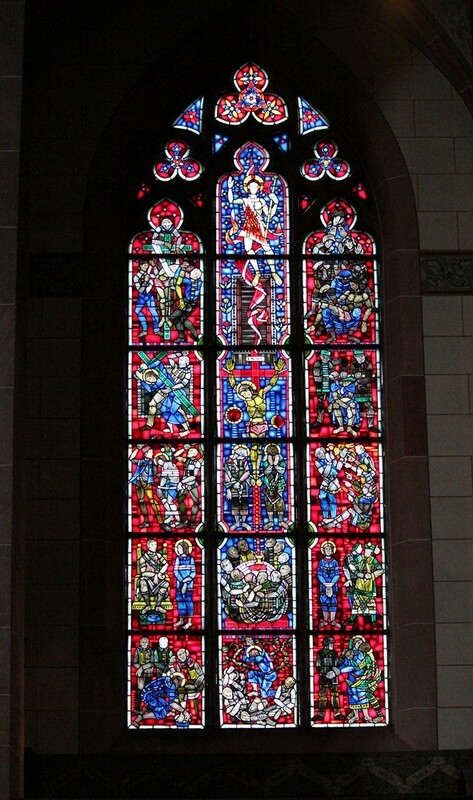 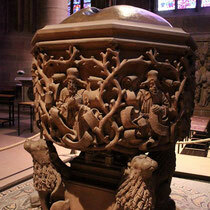 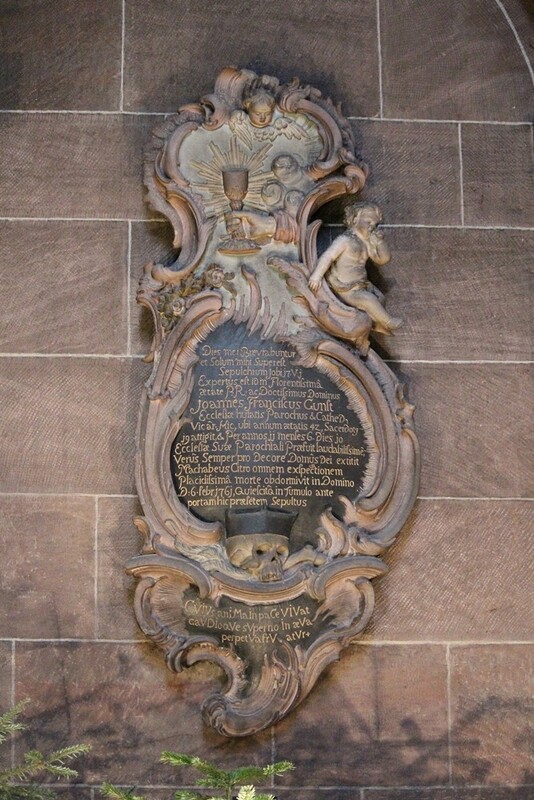 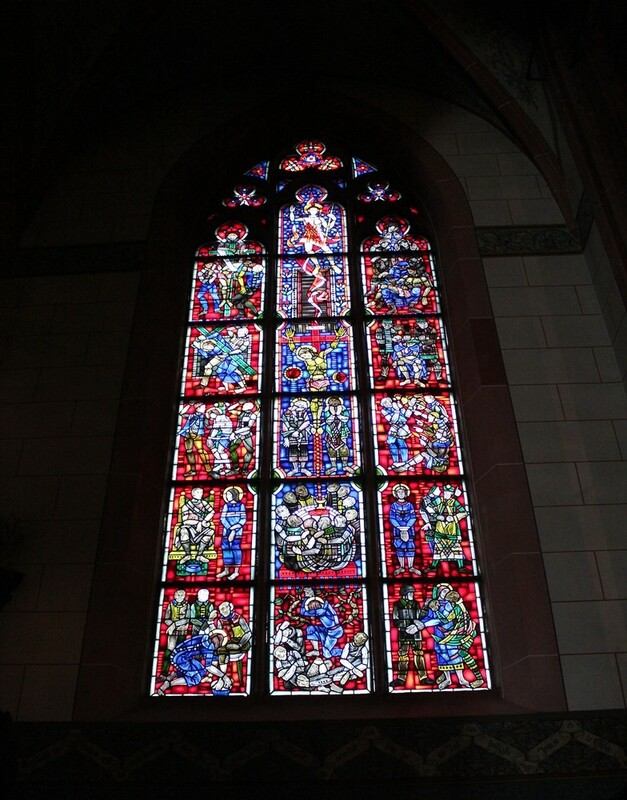 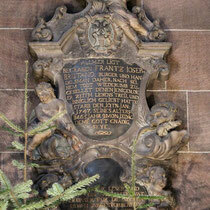 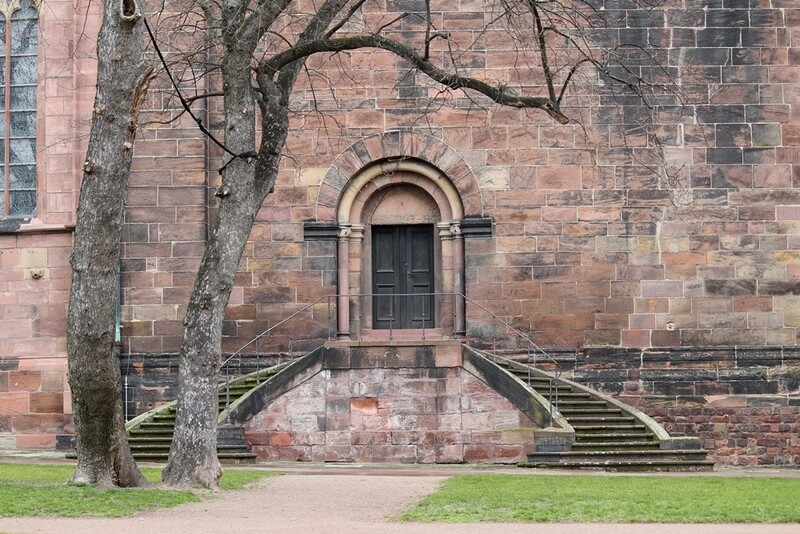 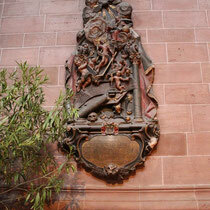 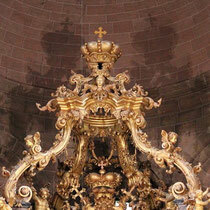 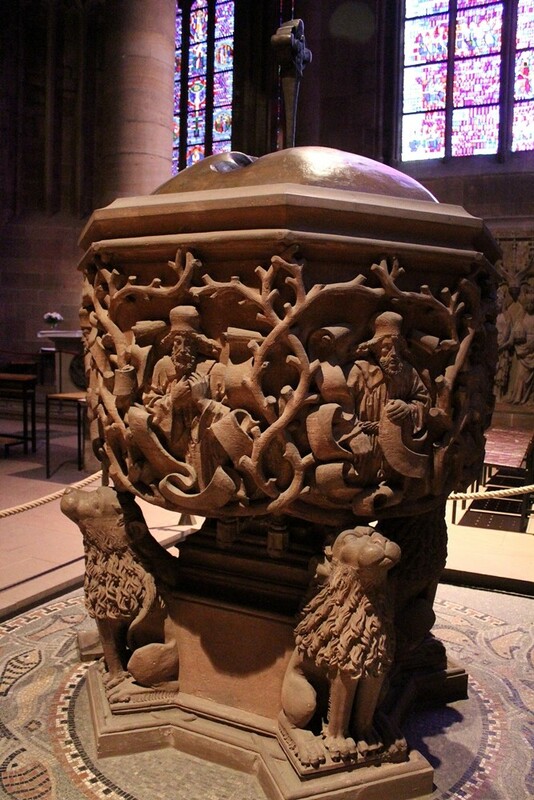 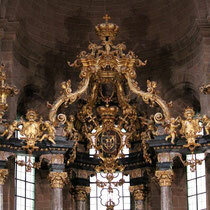 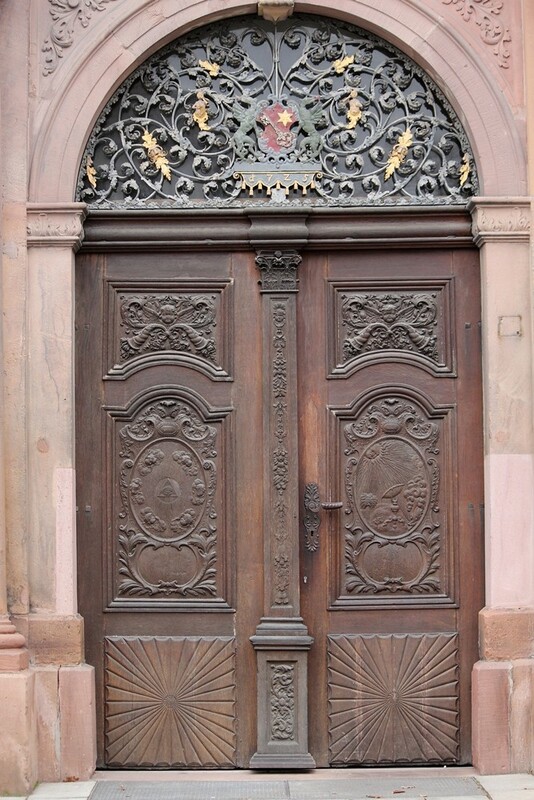 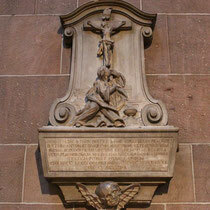 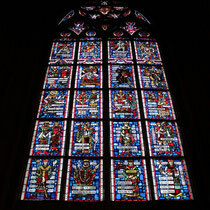 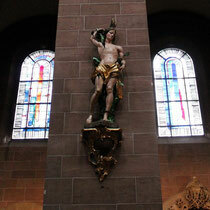 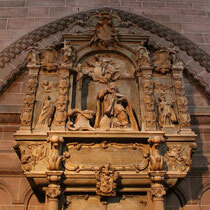 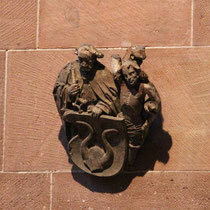 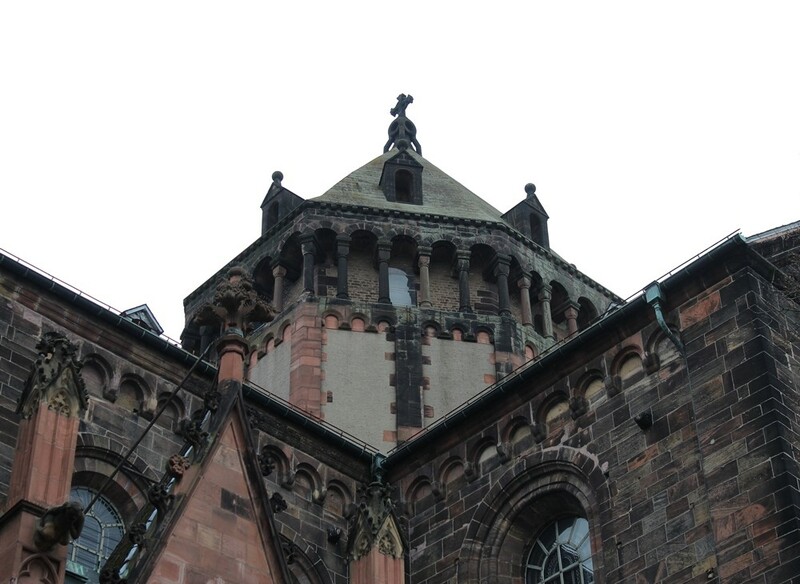 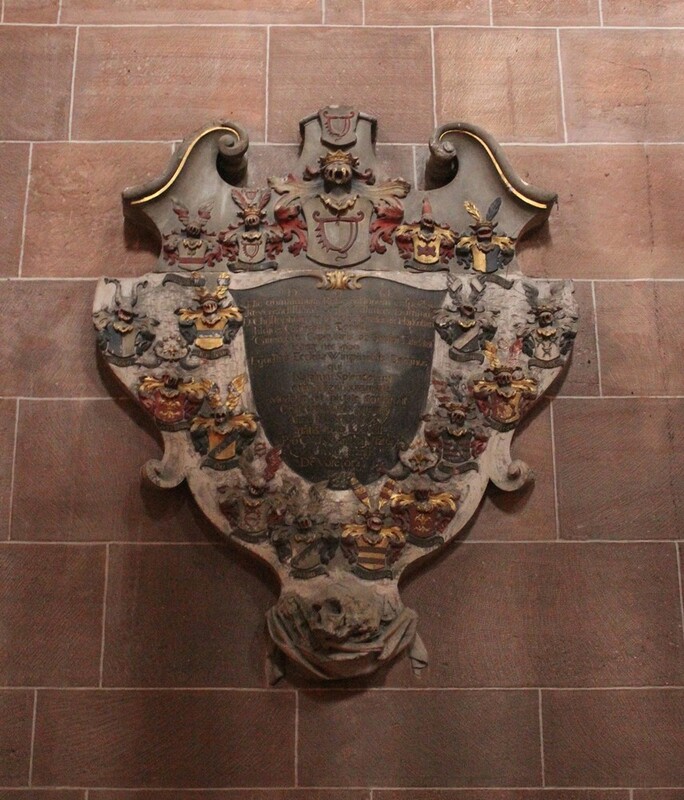 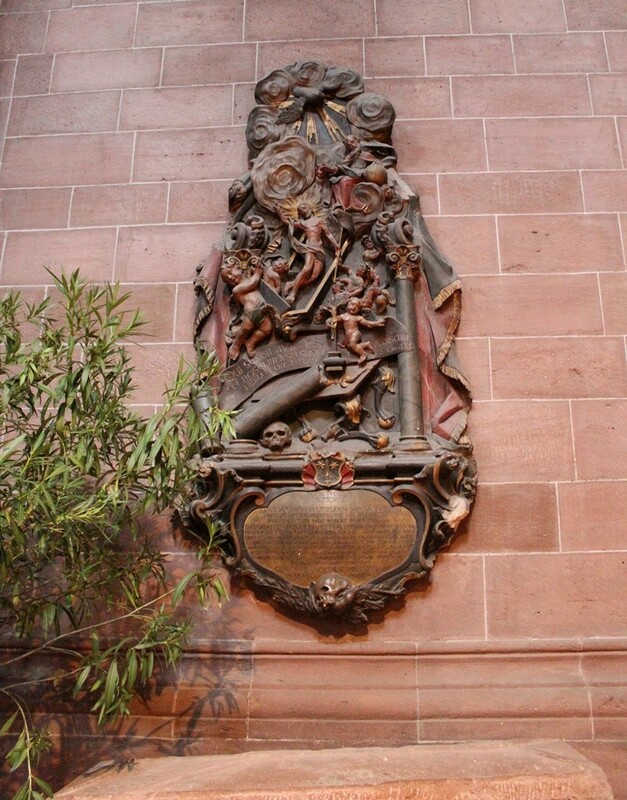 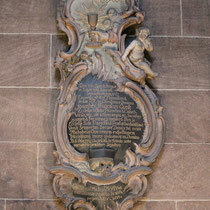 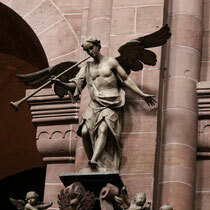 The cathedral was a burial place for the Salian royal family, who had a castle in Worms well into the 11th century. 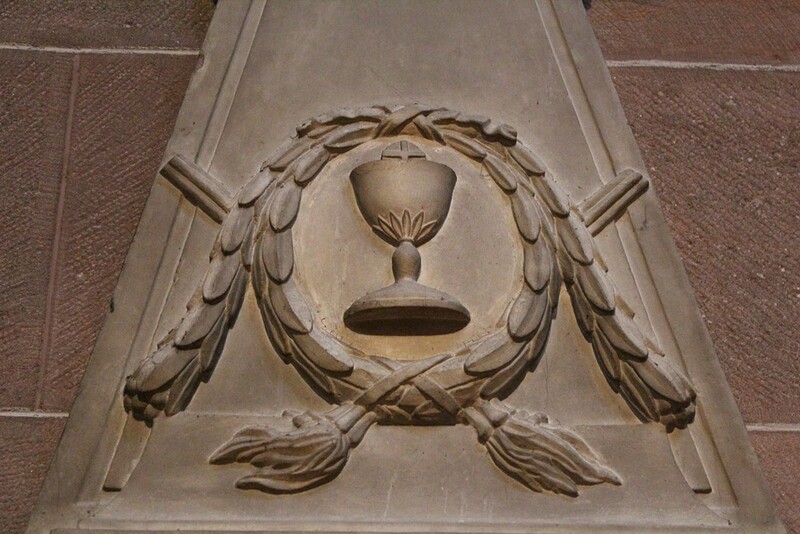 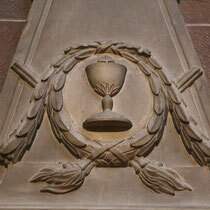 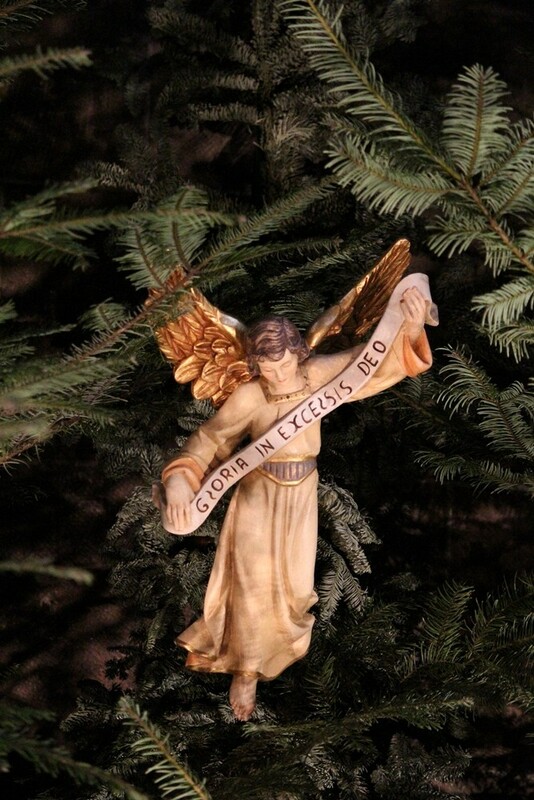 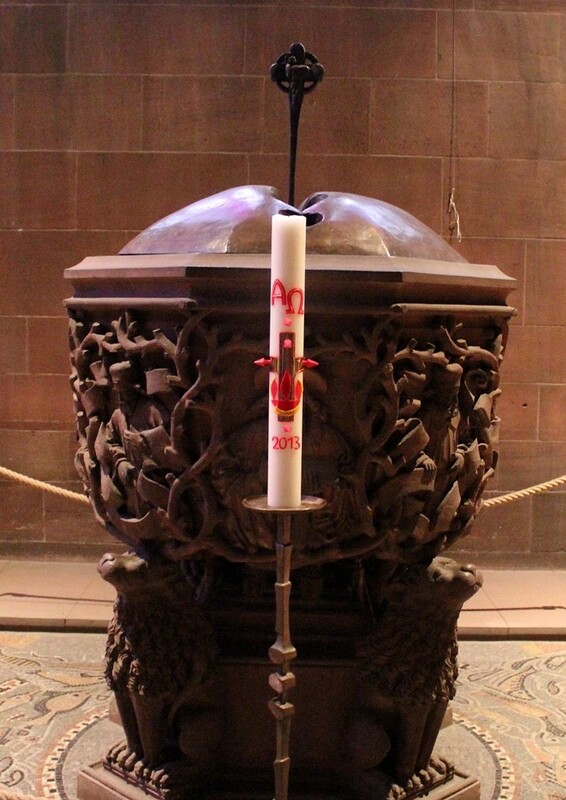 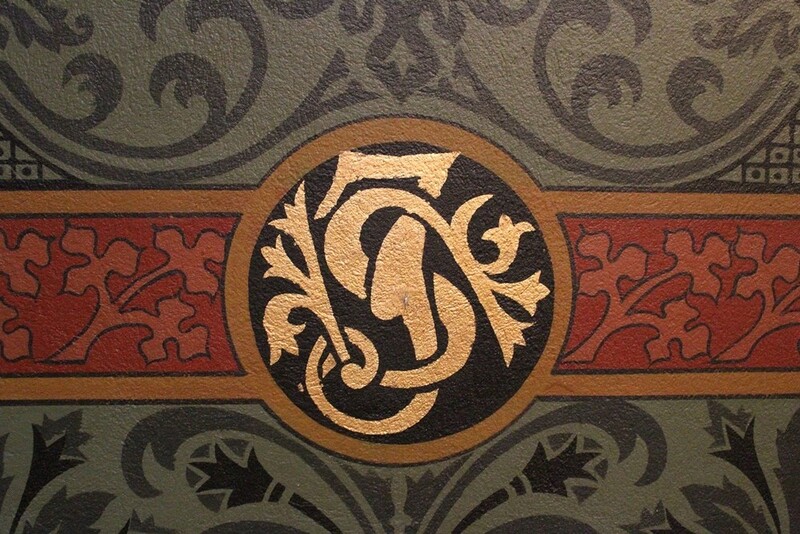 These can still be seen in the crypt. 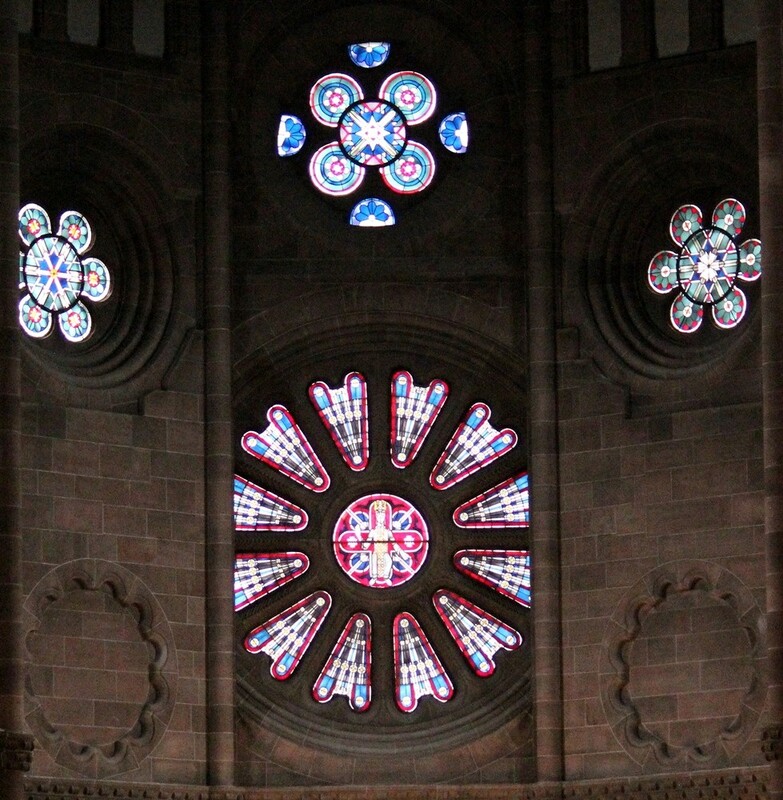 A century later, Burchard's building was replaced by the present cathedral, an even more splendid High Romanesque structure. 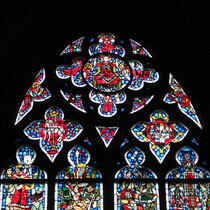 The east section was the first part to be built, in 1125-44. The nave was constructed 1160-70 and the chancel was mostly completed by 1181, when the cathedral was consecrated. 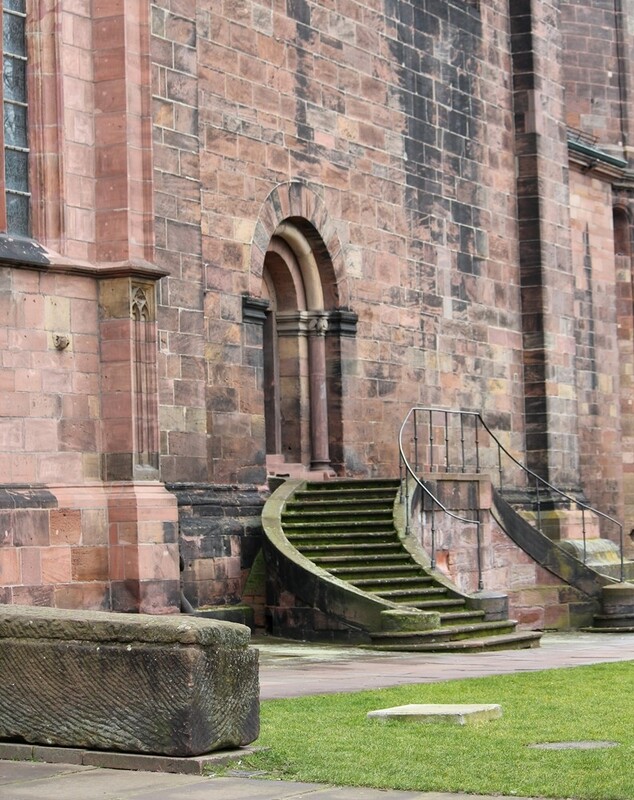 The west end was the last to be built, at the end of the 12th century. 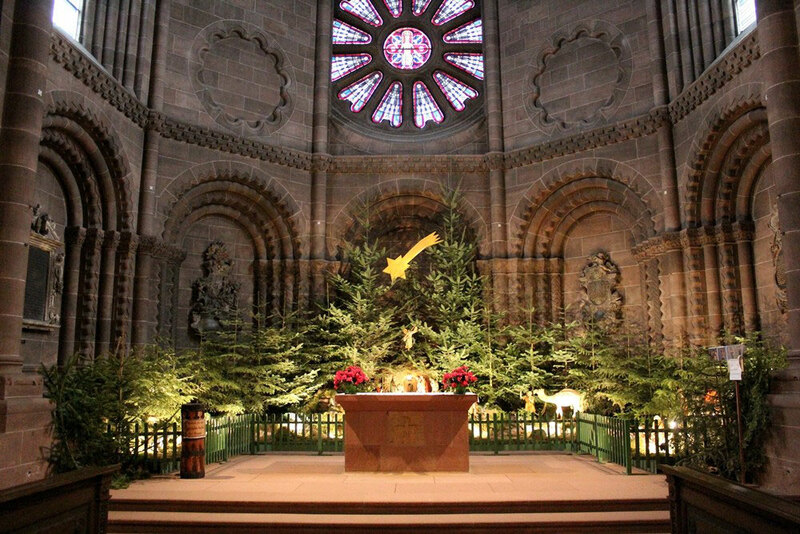 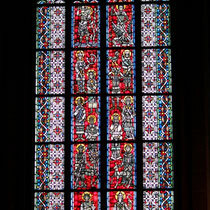 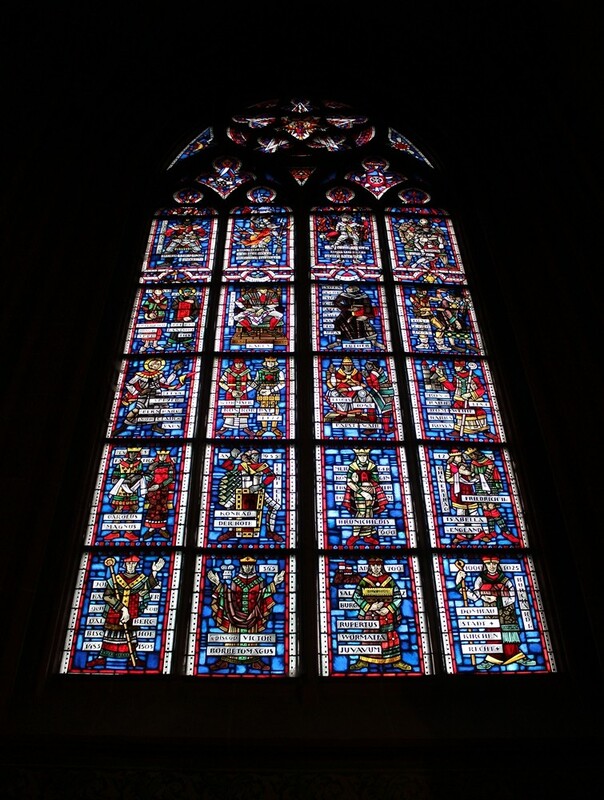 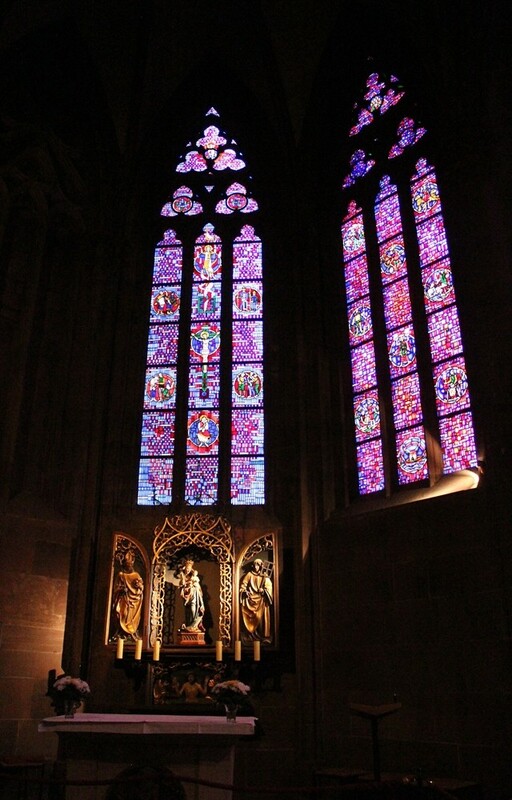 During the Middle Ages, numerous visits from the Emperor and many important events, some with serious political consequences, took place in the cathedral and it surroundings. 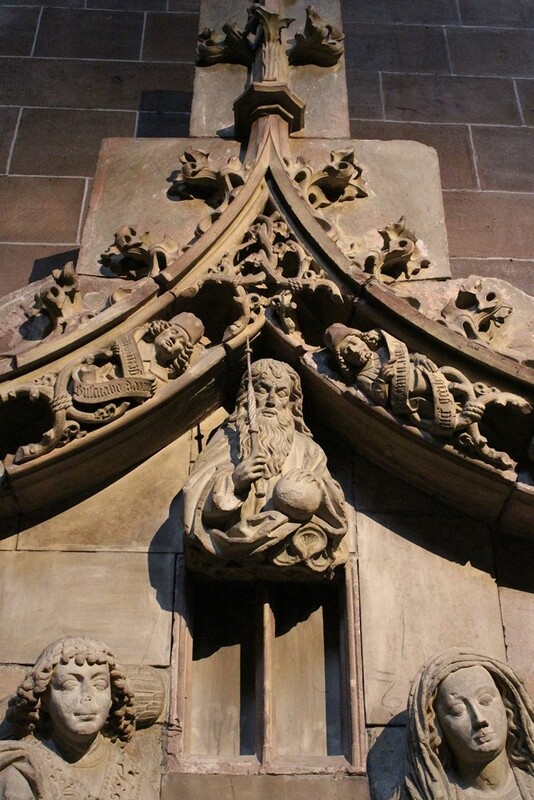 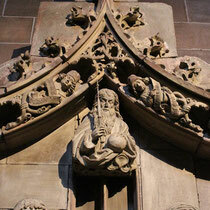 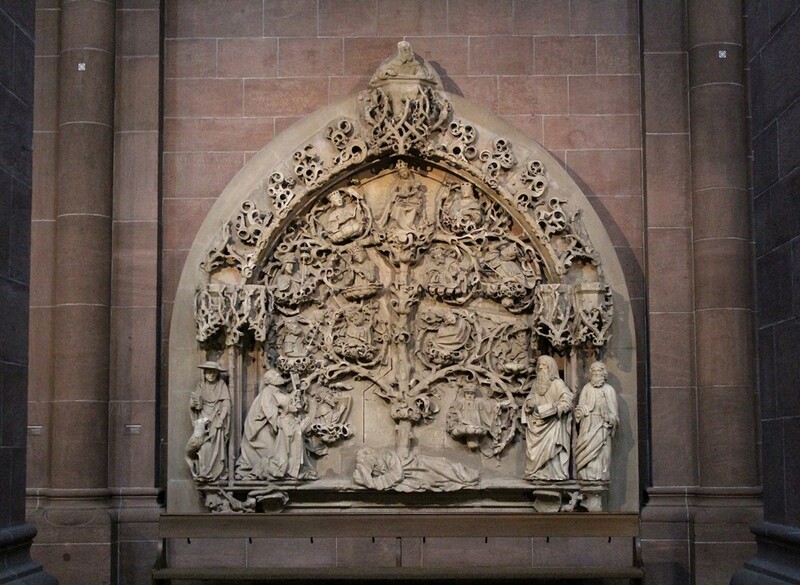 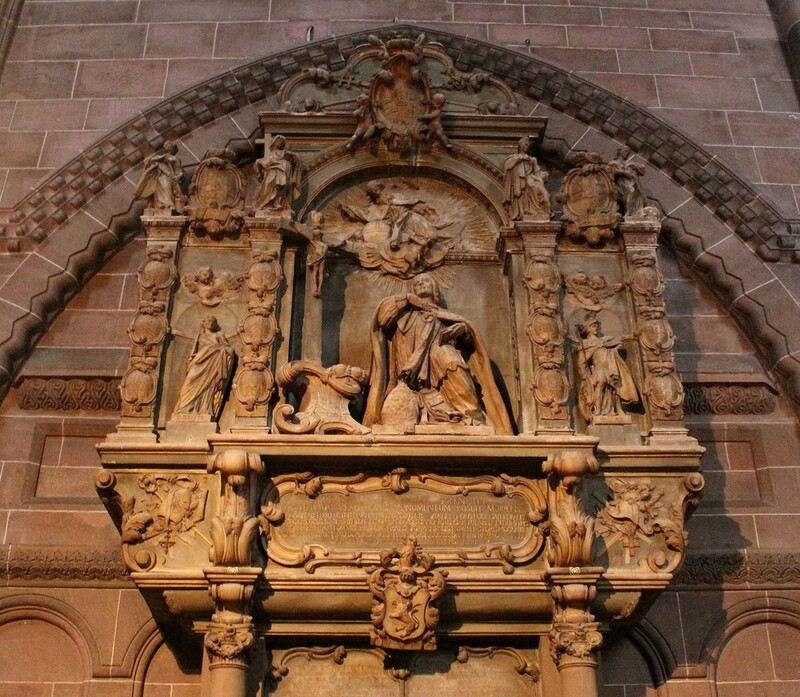 Around 1300, the Nikolaus Chapel in the cathedral was replaced with a Gothicchapel and the south portal was re-carved in an impressive Gothic style. 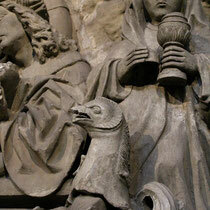 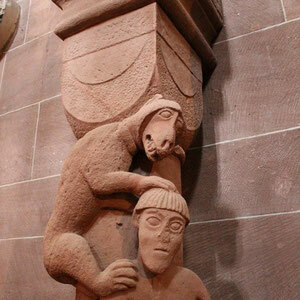 A Late Gothic cloister was carved with scenes from the life of Jesus around the end of the 15th century; these now stand in the north nave. 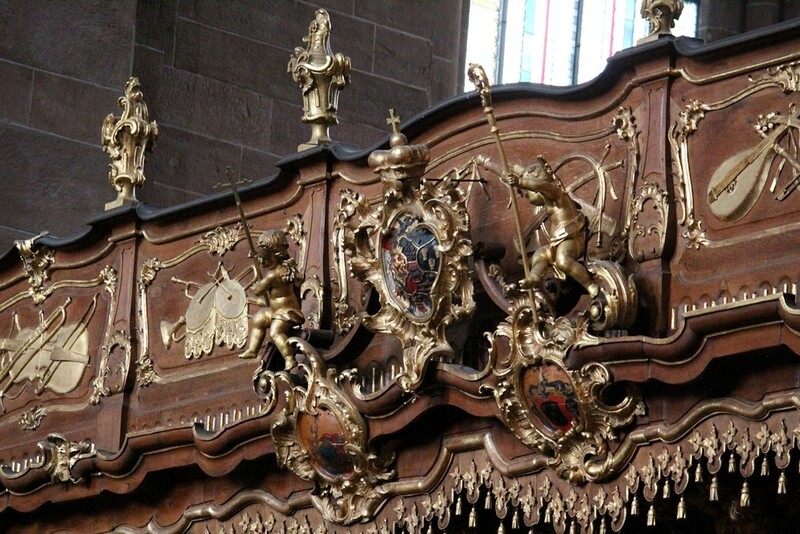 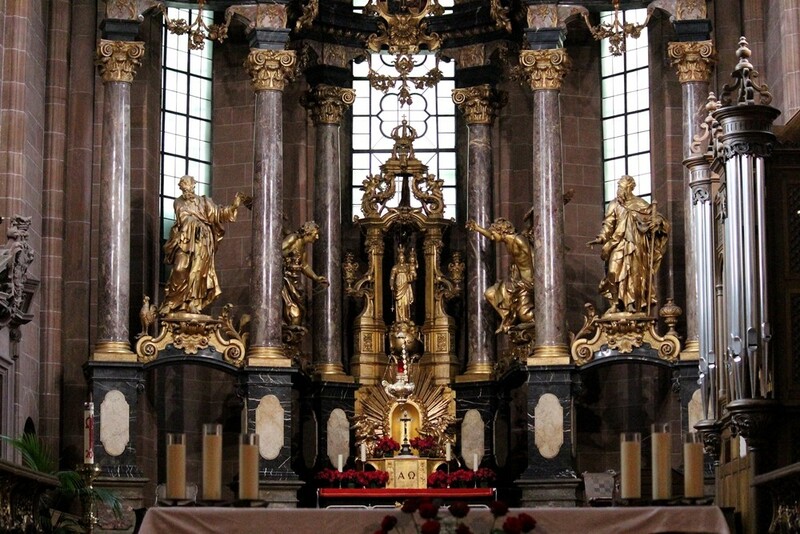 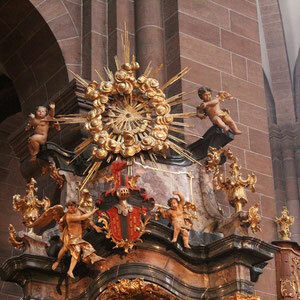 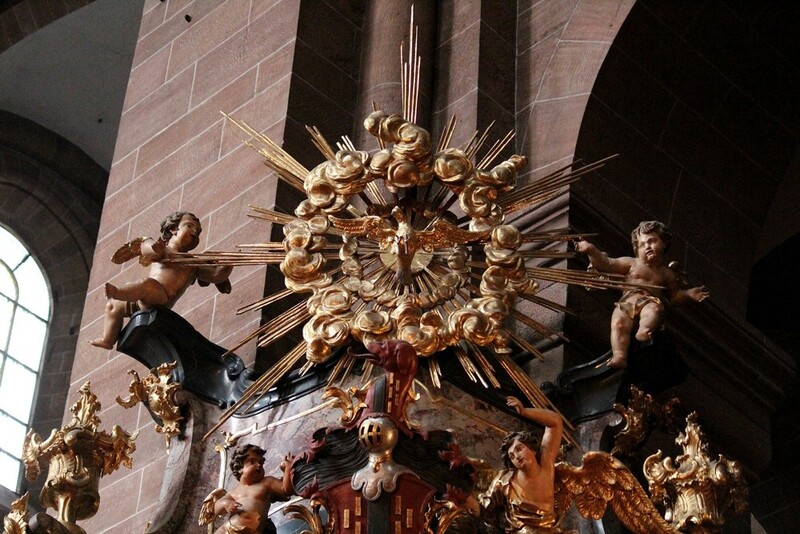 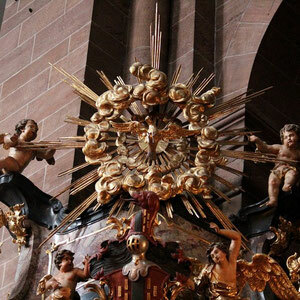 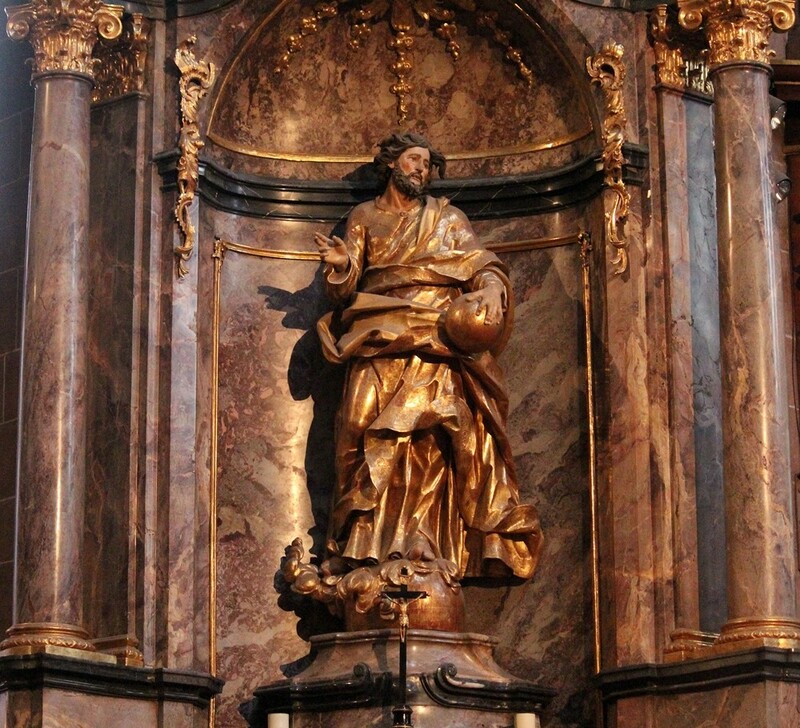 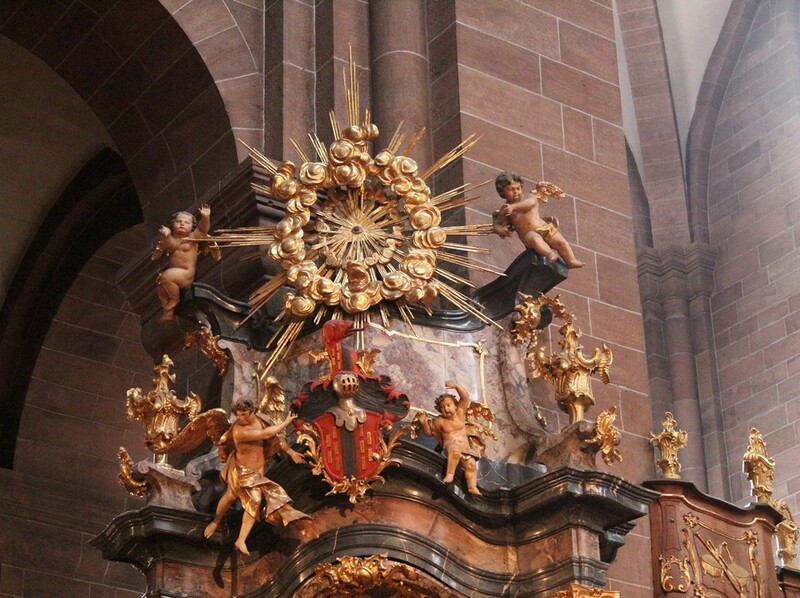 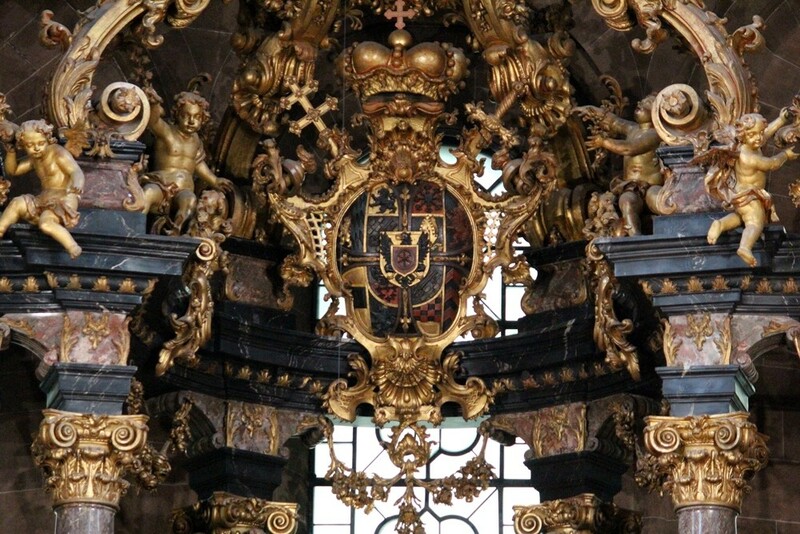 In the late 17th century, after the town was badly damaged during wars against the French, a Baroque high altar by Balthasar Neumann was added to the cathedral." 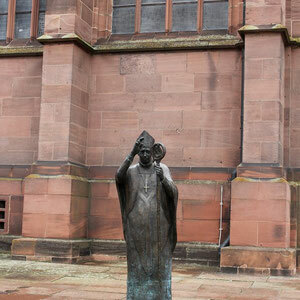 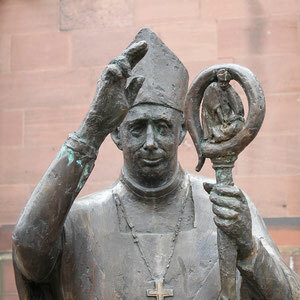 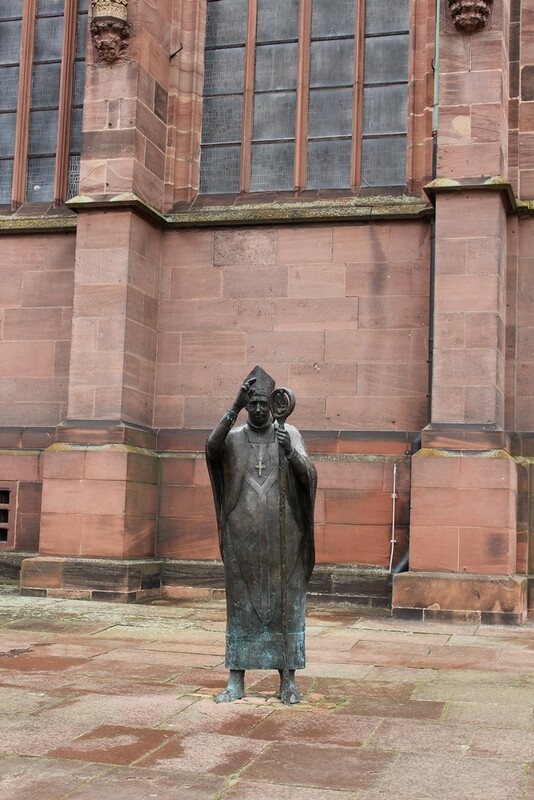 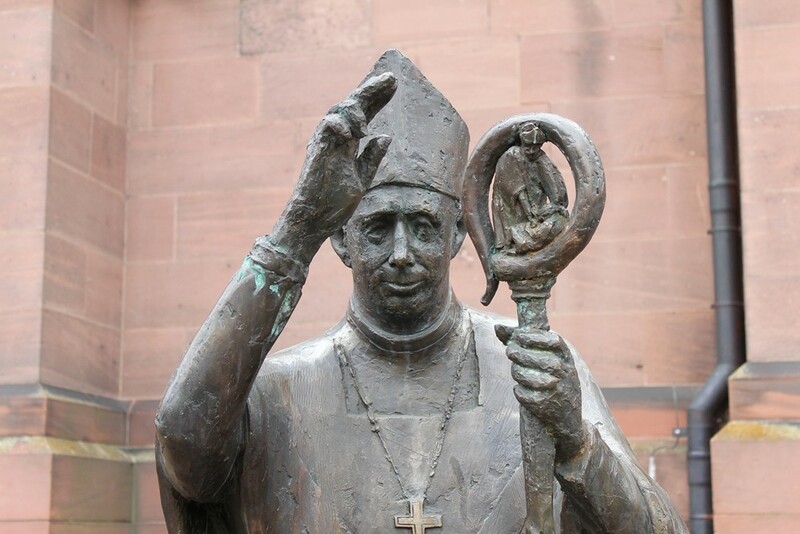 In front of the cathedral the statue of Bishop Burchard I. blesses the visitors. 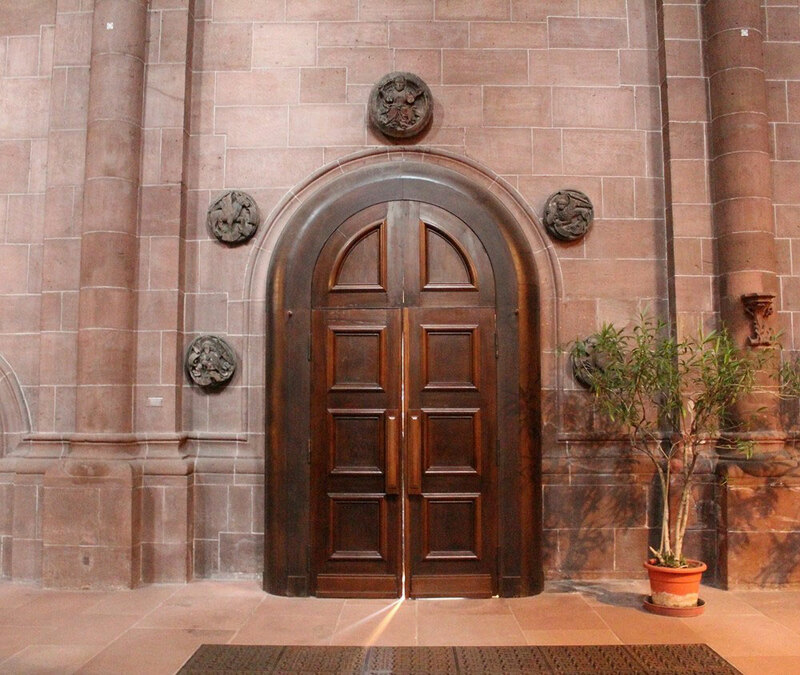 Usually visitors enter through the south portal. 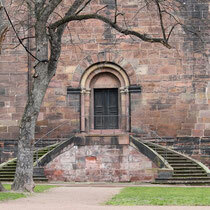 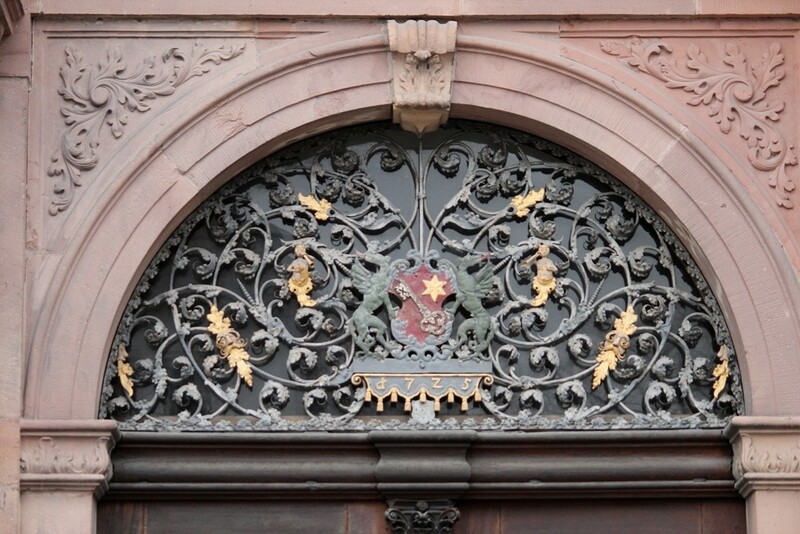 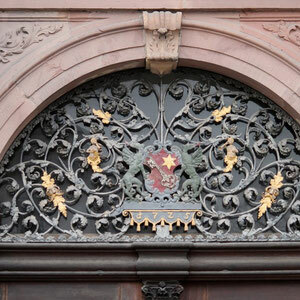 The north portal - which was destroyed in 1689 - was the place of a scene from the Nibelungenlied. 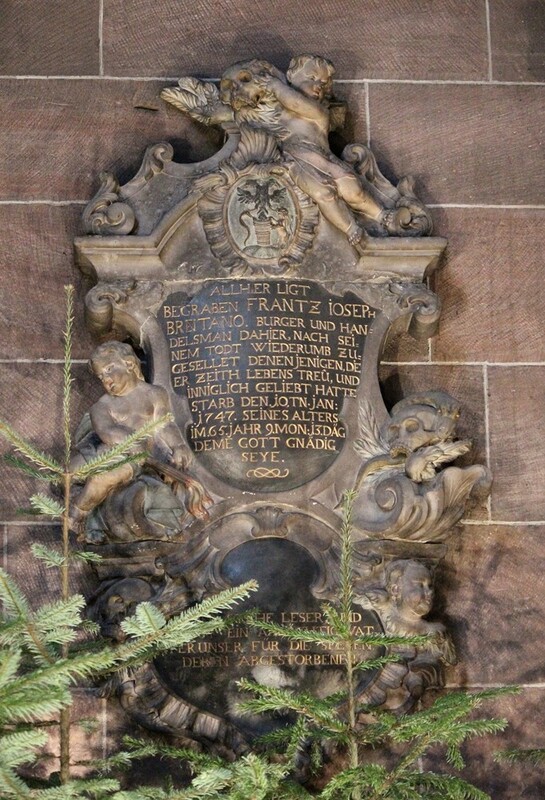 The rival queens Kriemhild and Bruenhilde fought over the rank of their husbands Gunther and Siegfried. The wife of the higher ranked husband would be allowed to enter the cathedral first. 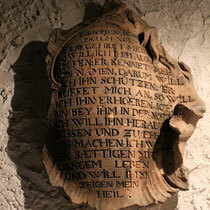 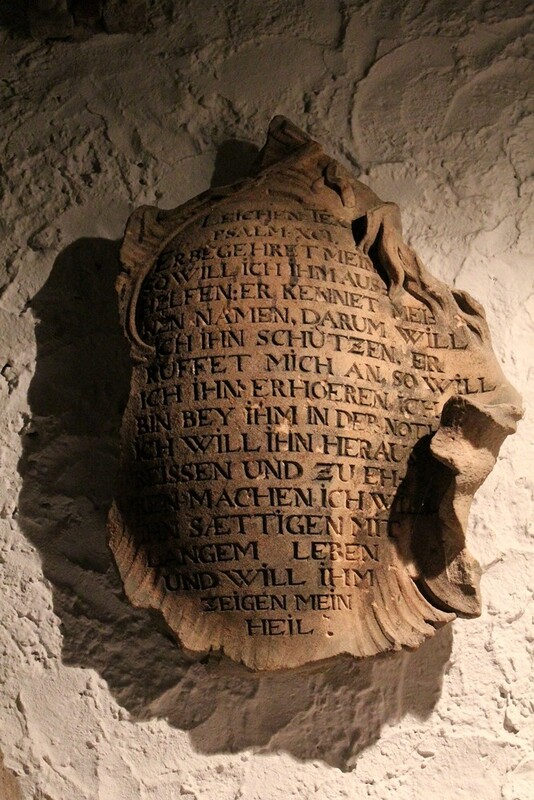 This dispute is one of the key factors that lead to Siegfried's death and the destruction of the Nibelungs. 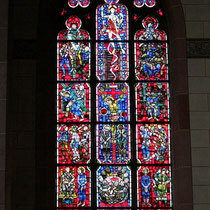 The south portal from inside. 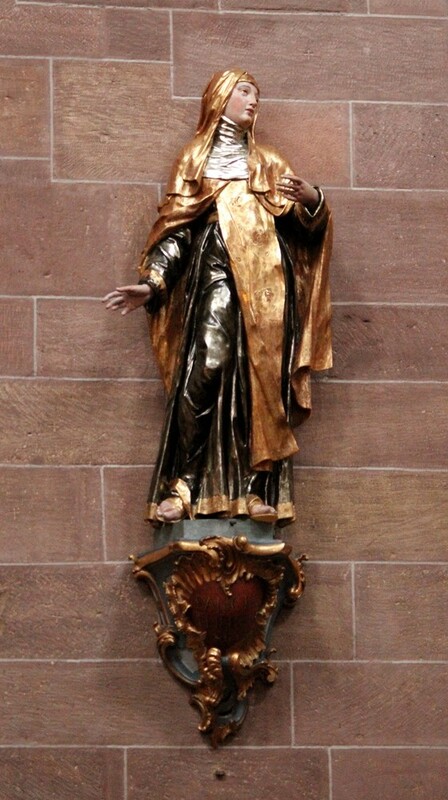 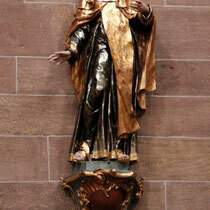 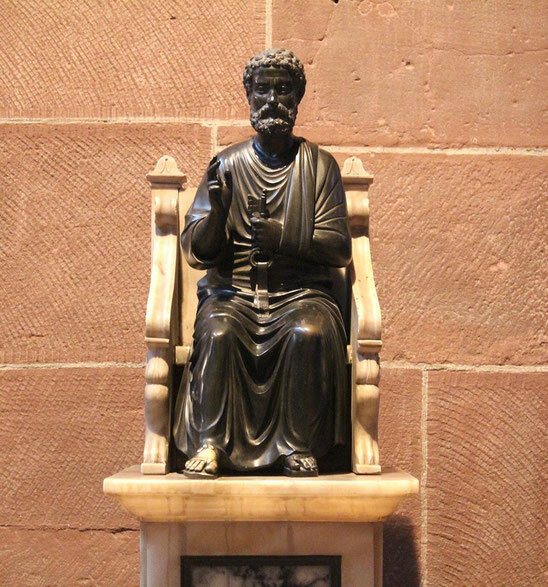 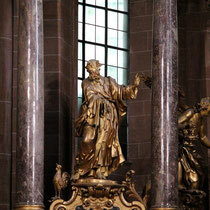 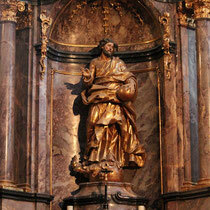 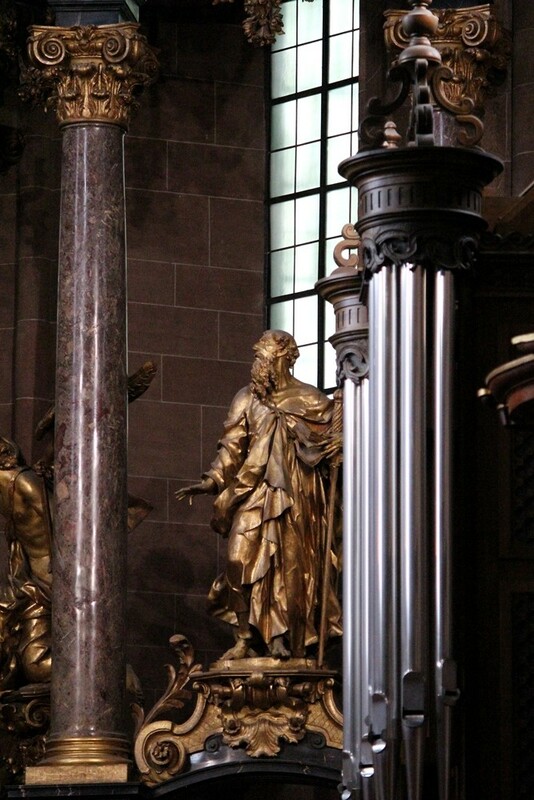 After entering one of the first things you see is a small statue of the patron saint of the cathedral - St. Peter. 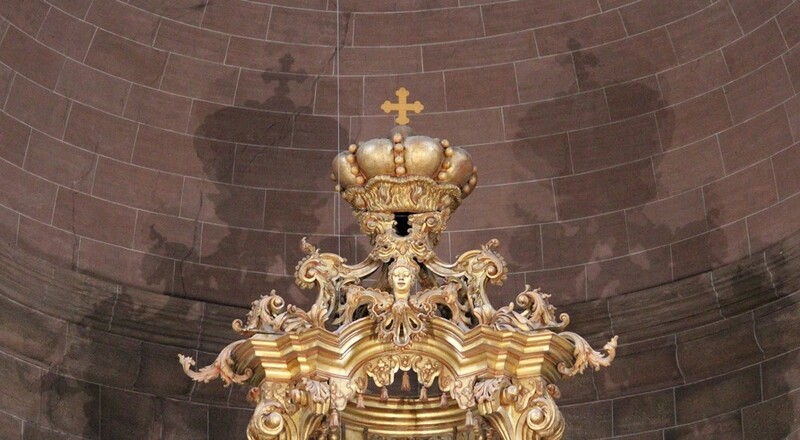 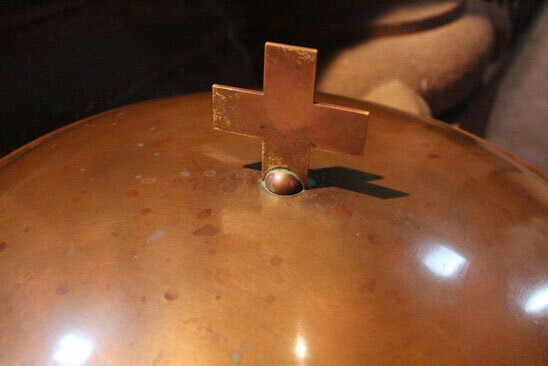 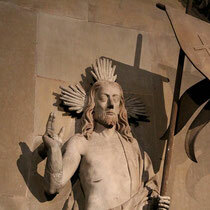 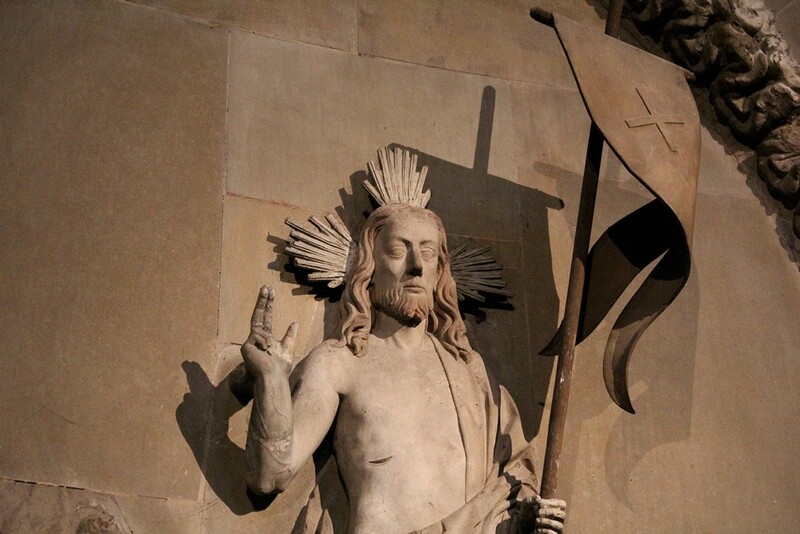 Close to him there is a bronze half-bowl with a cross on its highest point. 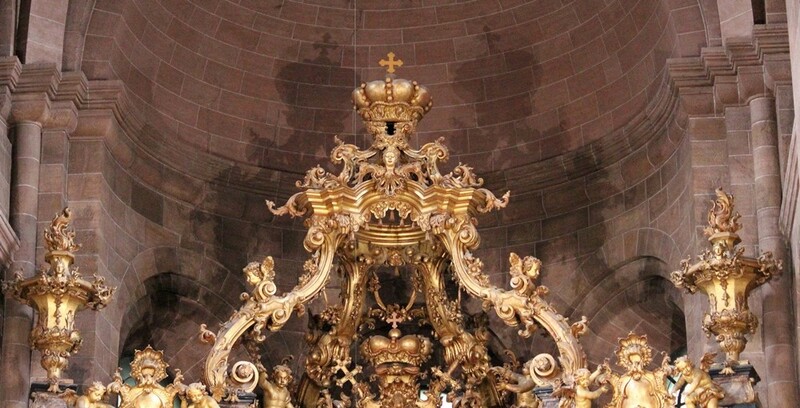 I assume it might be a baptistry. 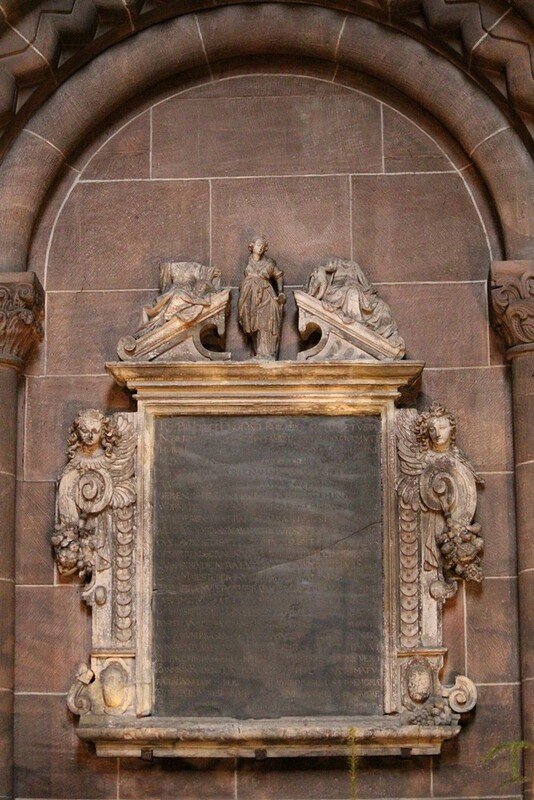 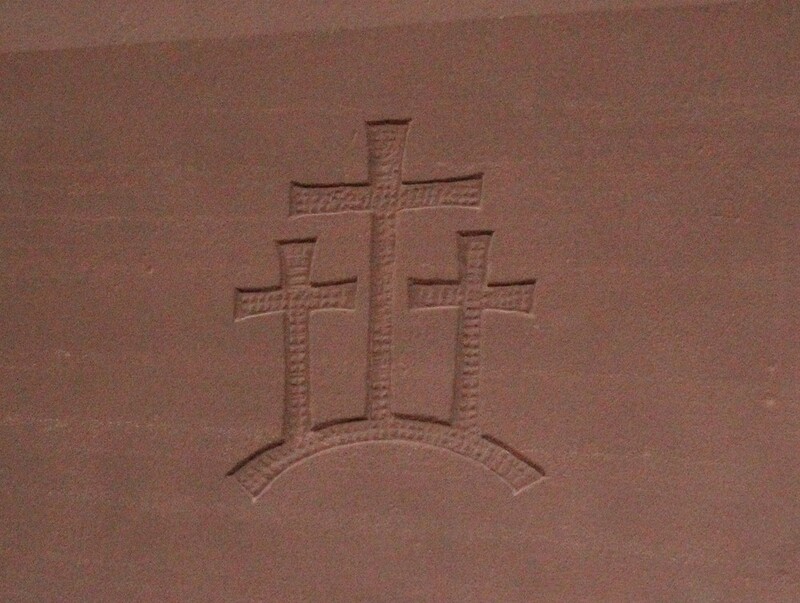 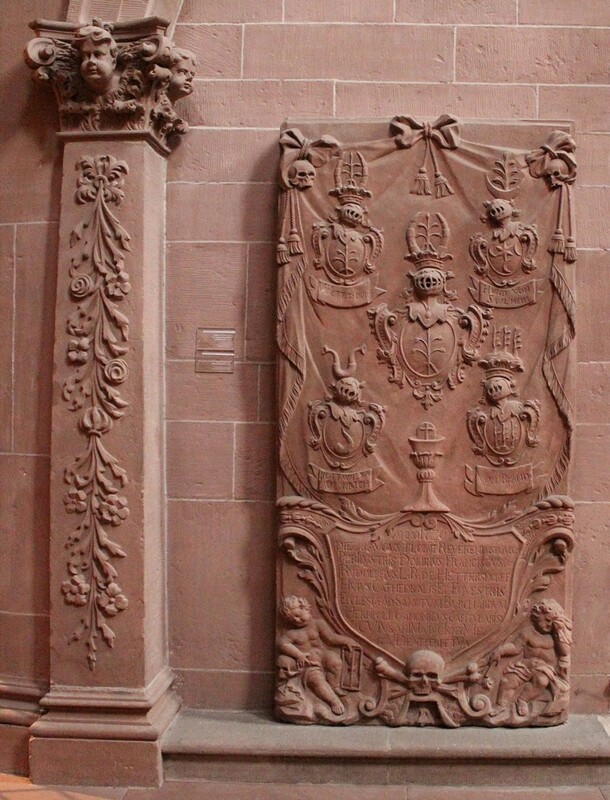 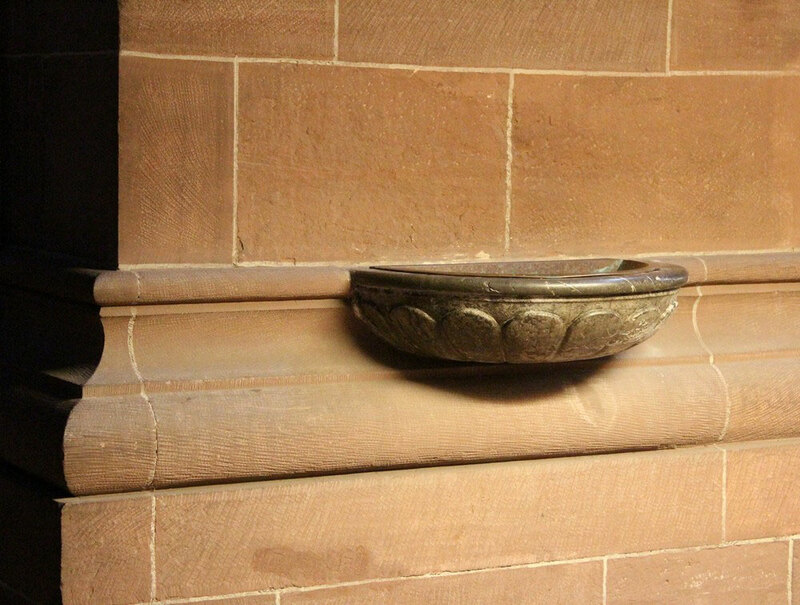 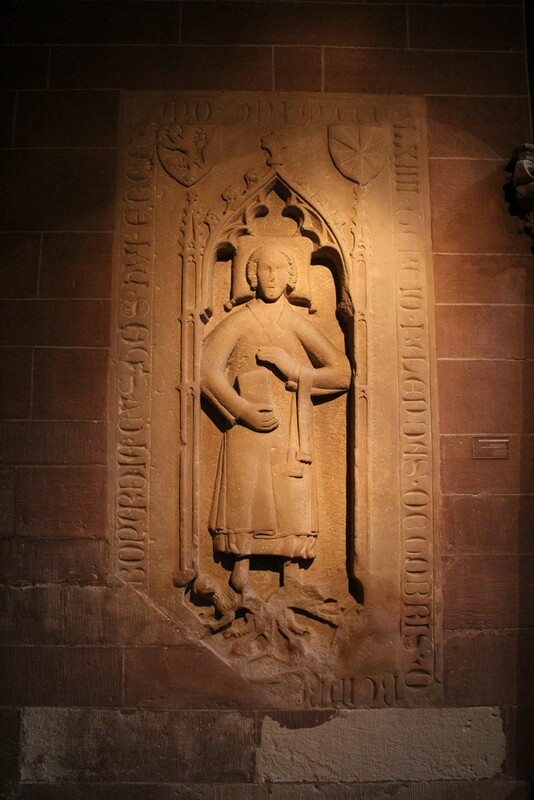 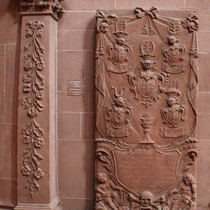 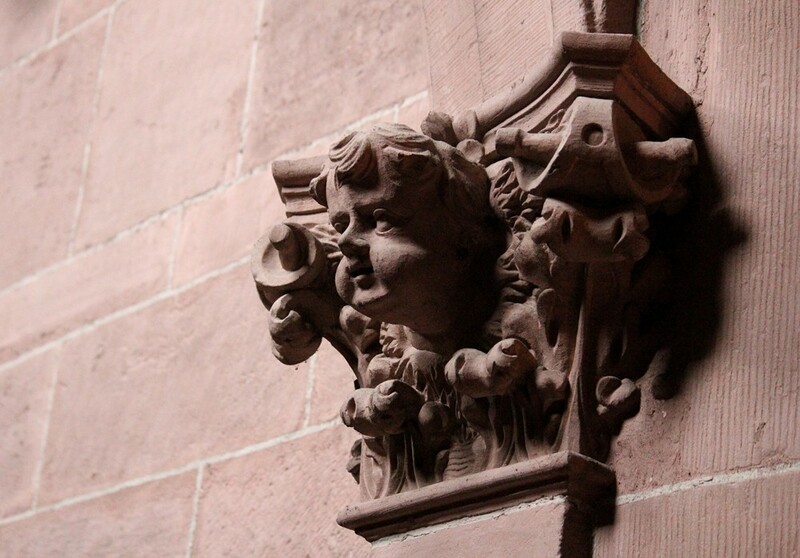 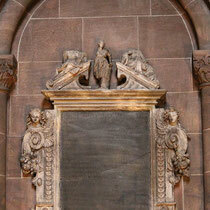 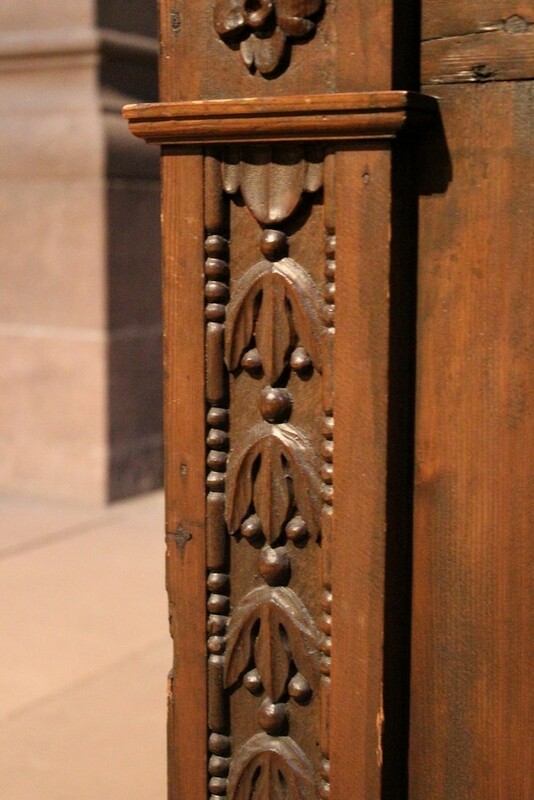 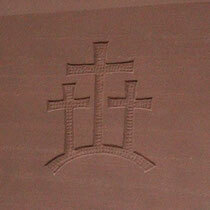 Several sandstone stoups can be found along the walls of the cathedral. 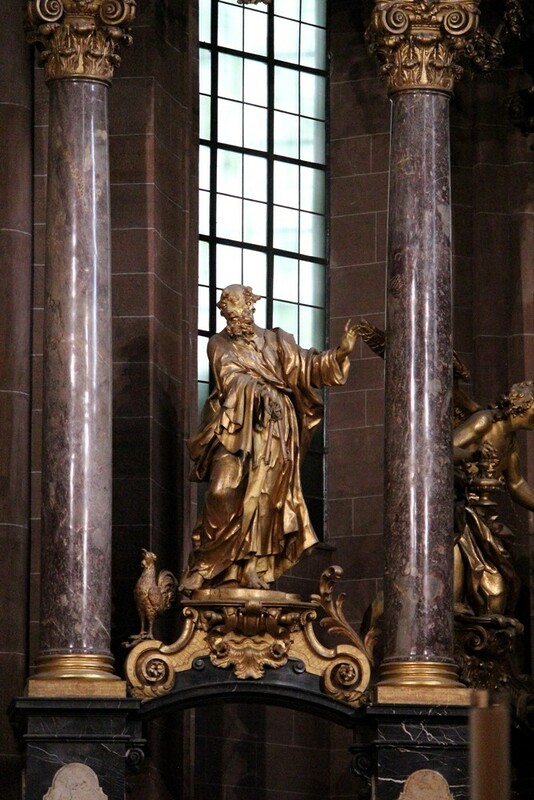 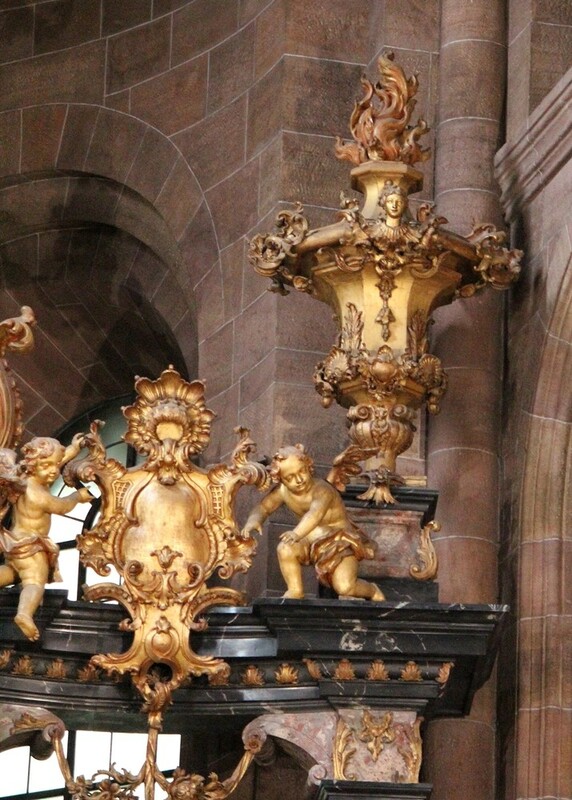 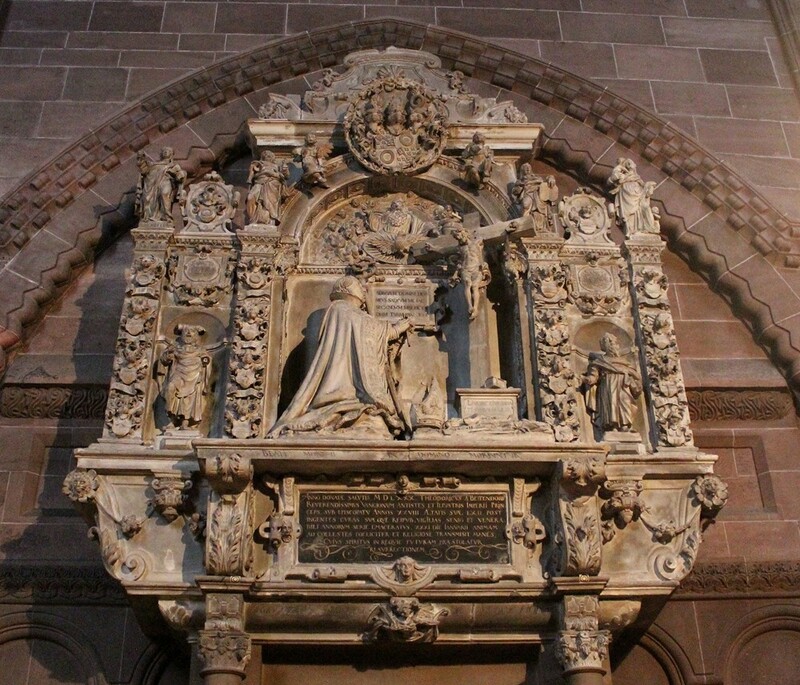 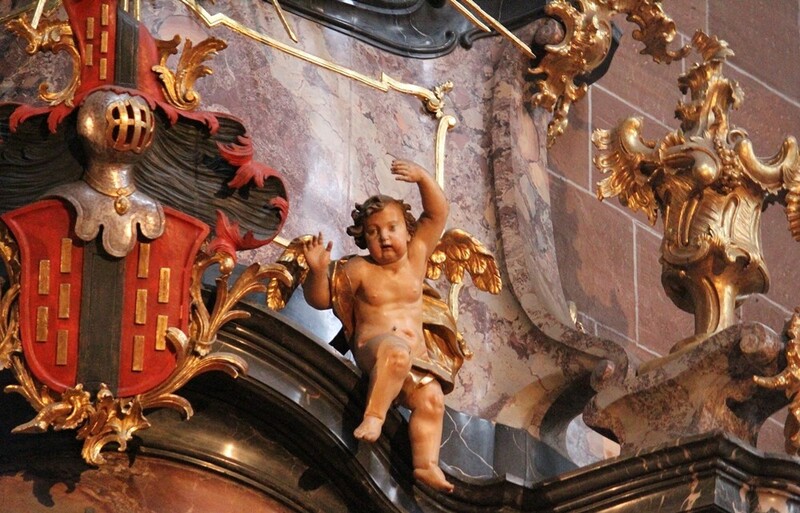 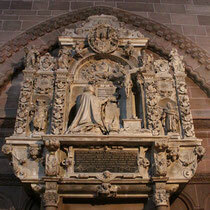 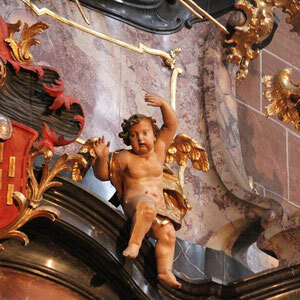 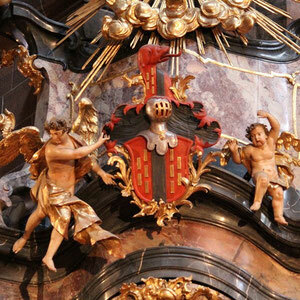 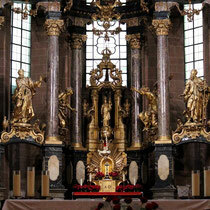 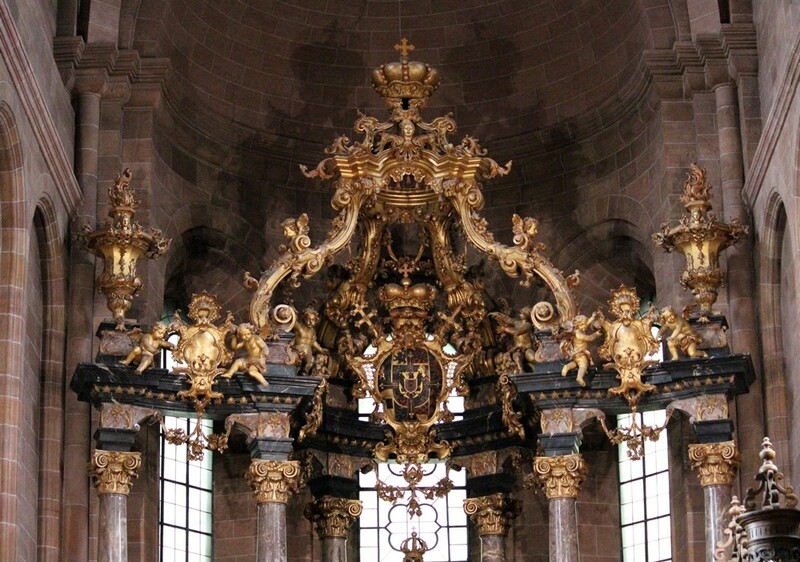 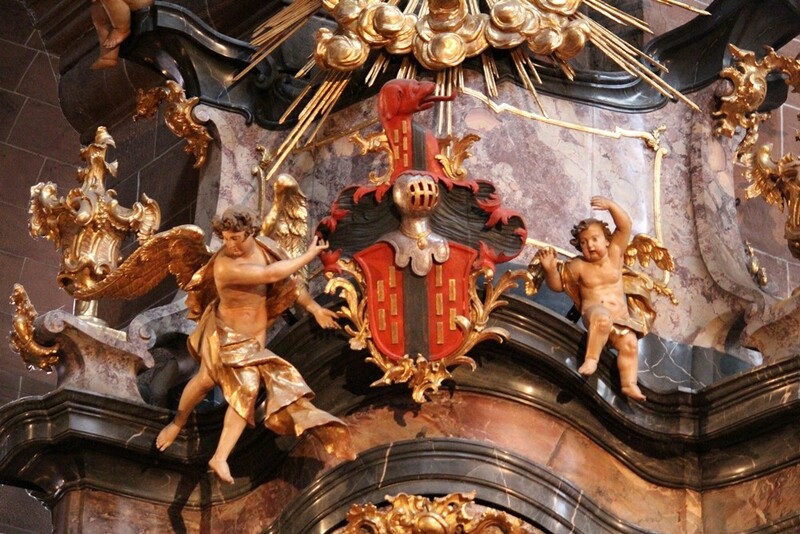 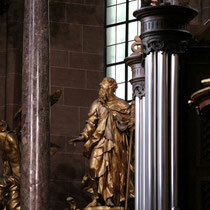 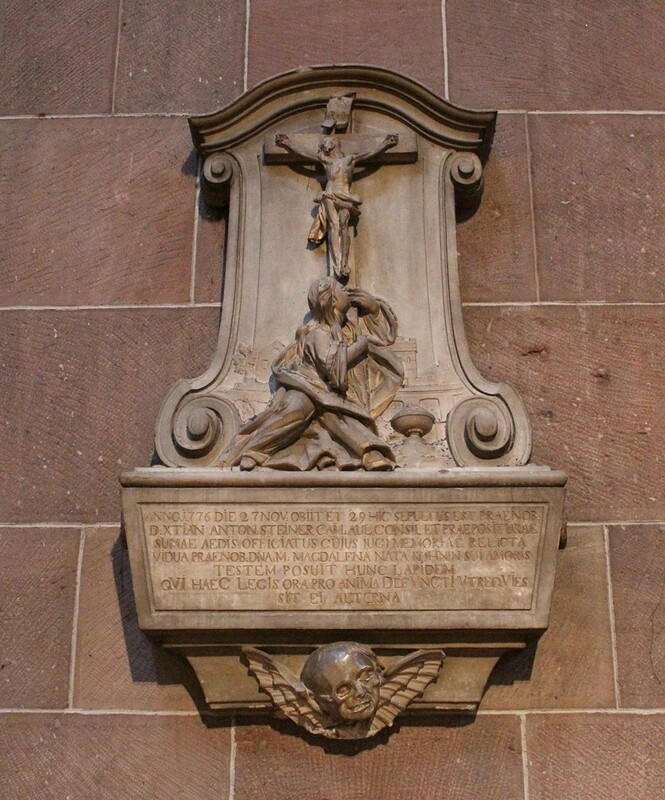 After the city was badly damaged in the late 17th century due to the war against the French a baroque high altar by Balthasar Neumann was added to the cathedral. 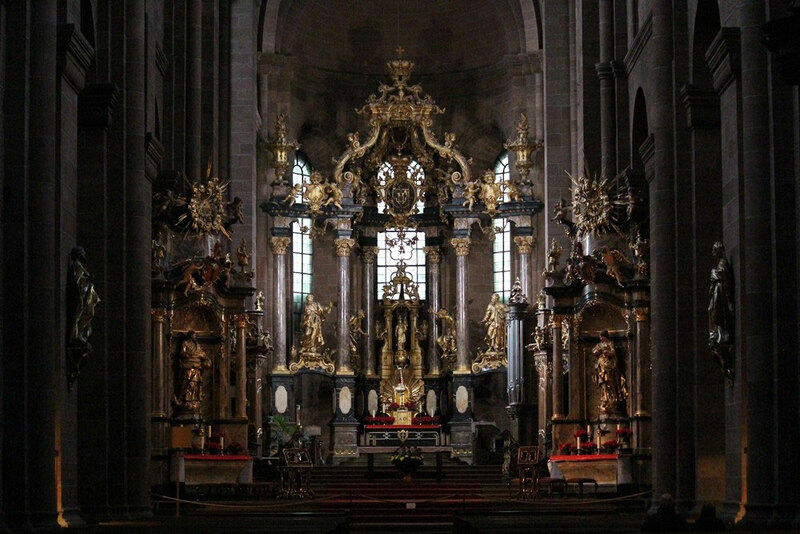 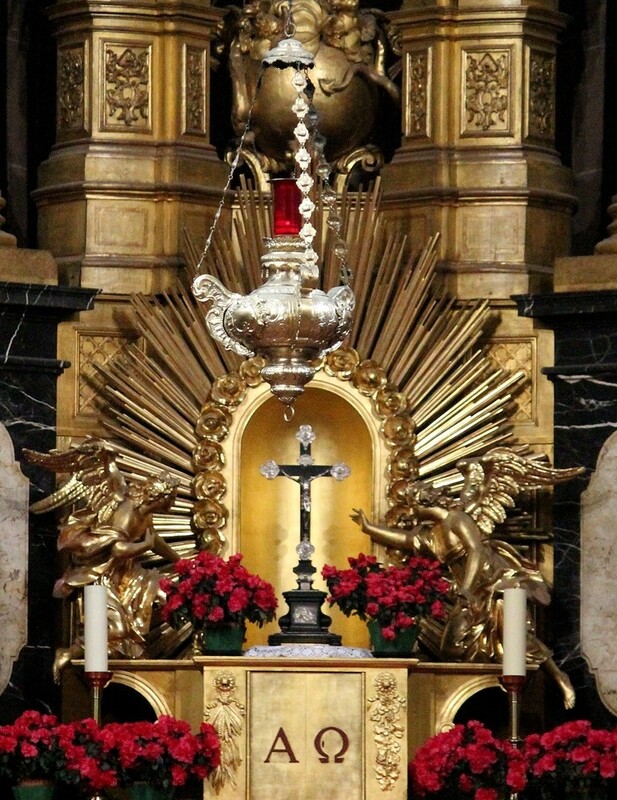 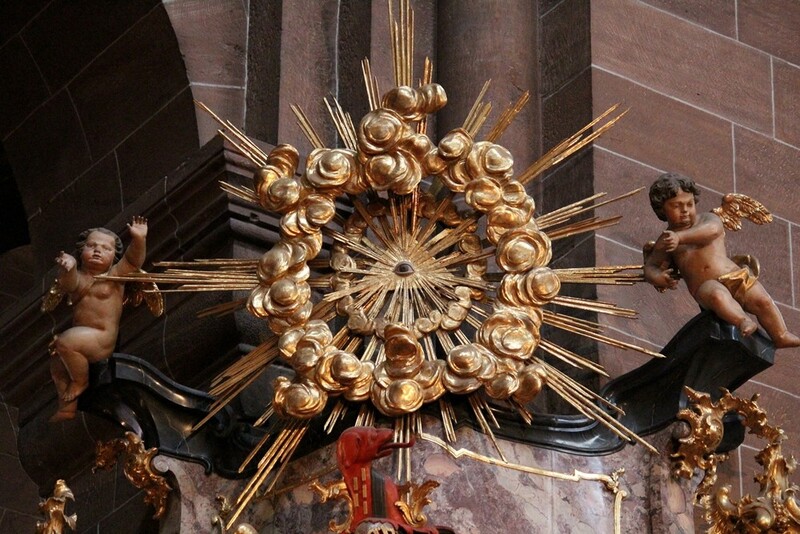 The splendor of this altar and the variety of details is incredible and absolutely beautiful. 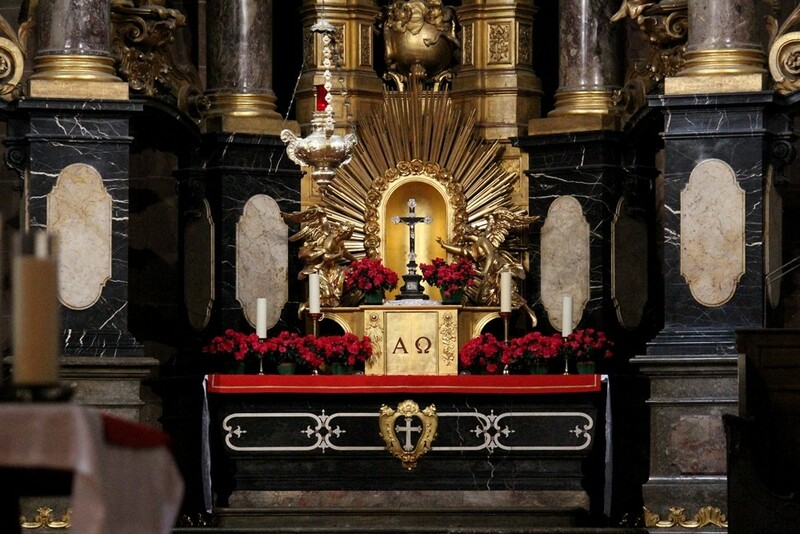 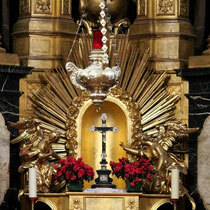 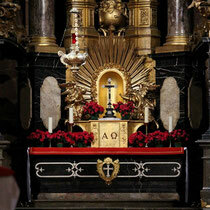 I think you could spend hours in front of that altar and still discover things you did not see before. 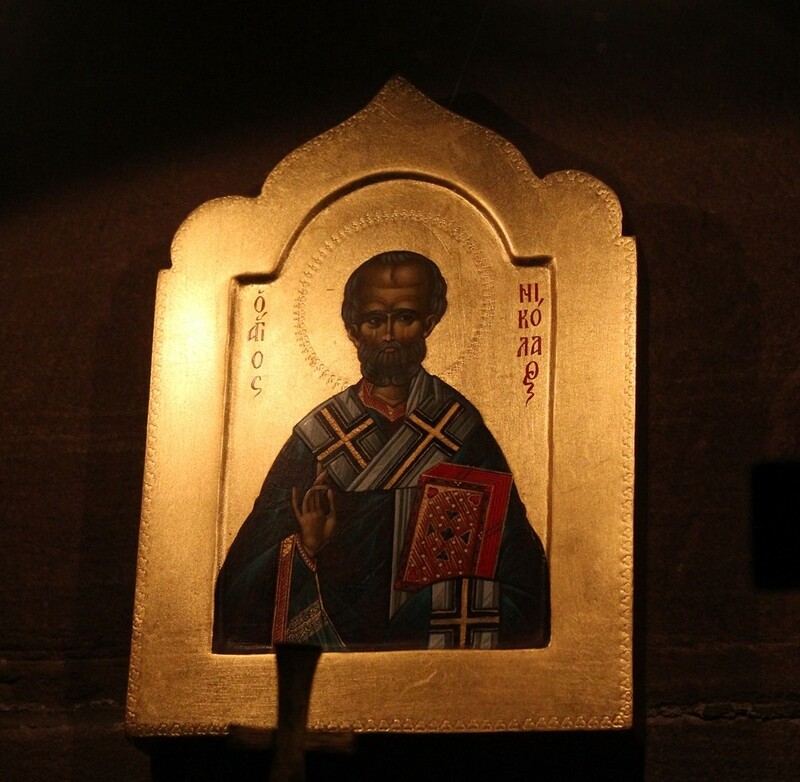 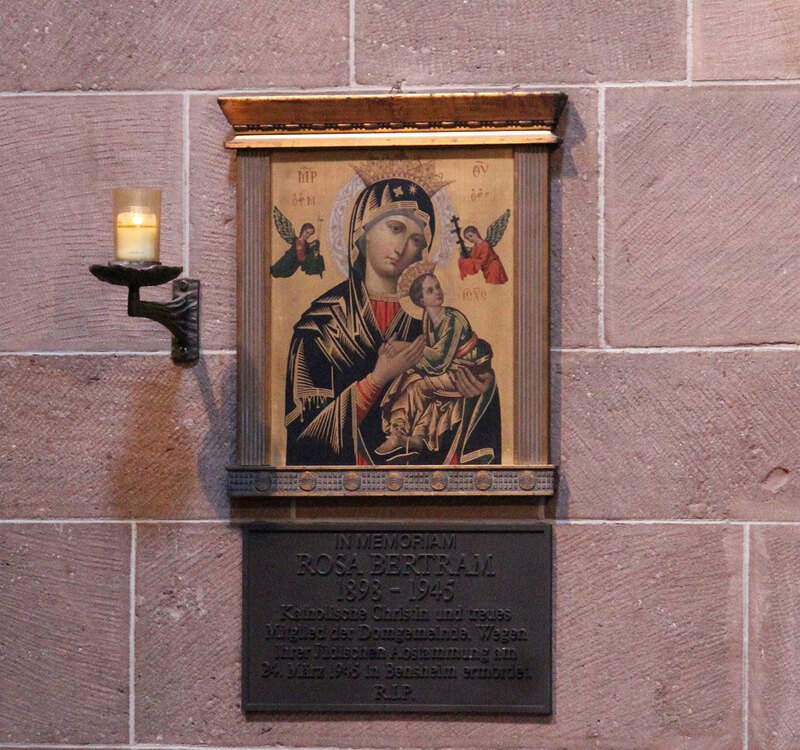 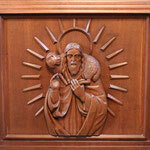 In one of the side chapels is this icon in honor of the parishioner Rosa Bertram. 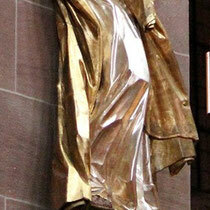 Due to her Jewish descent she was murdered in March 1945. 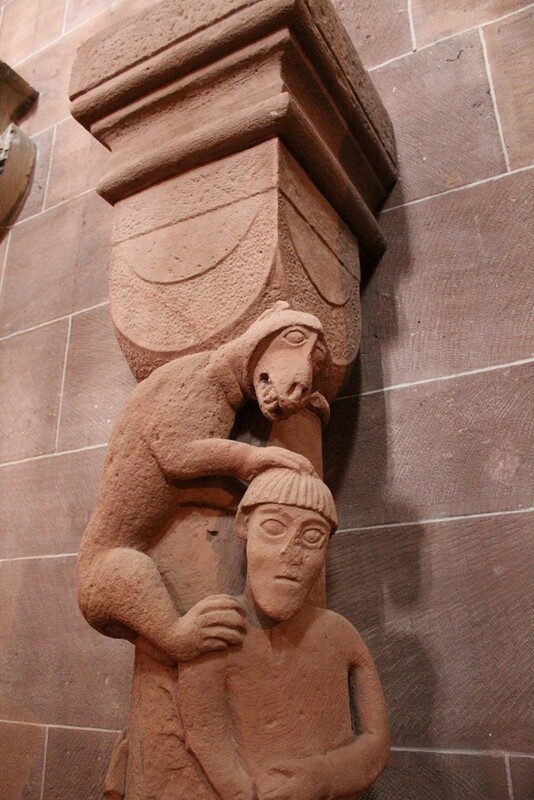 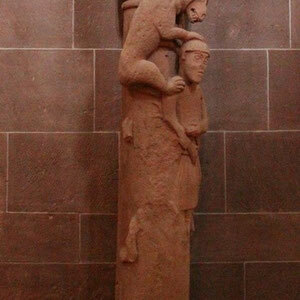 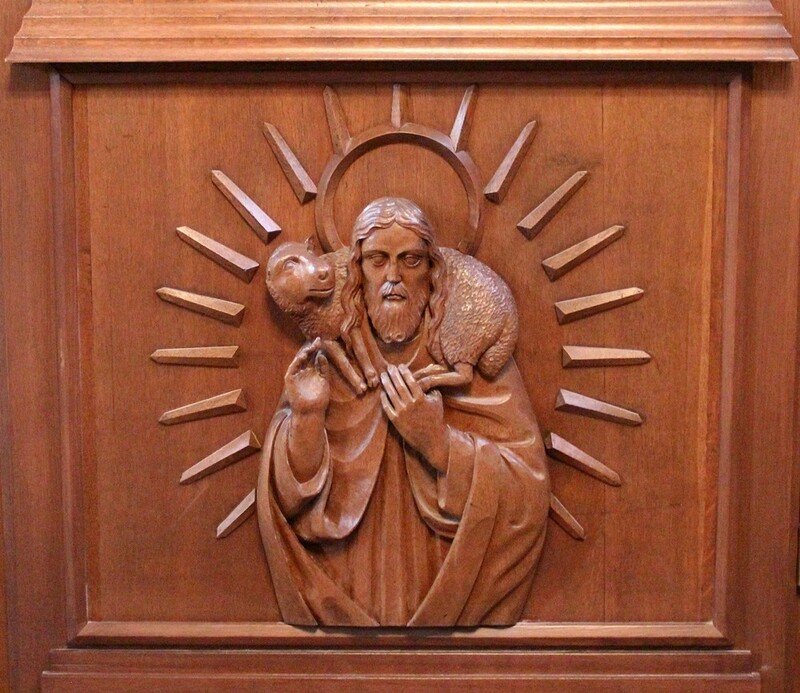 Also in one of the side chapels you can find this statue of a man with a monkey on his back. 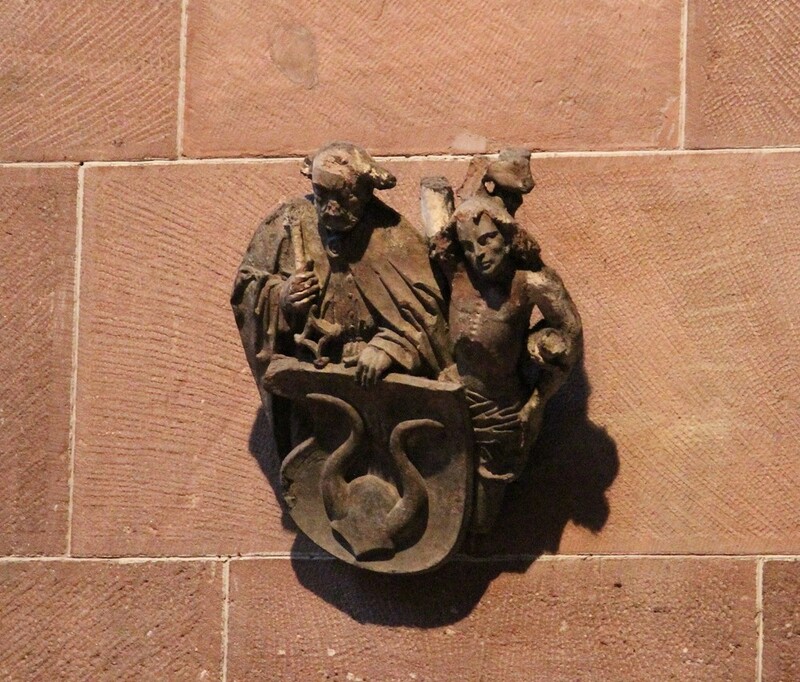 Supposedly it depicts the head mason. 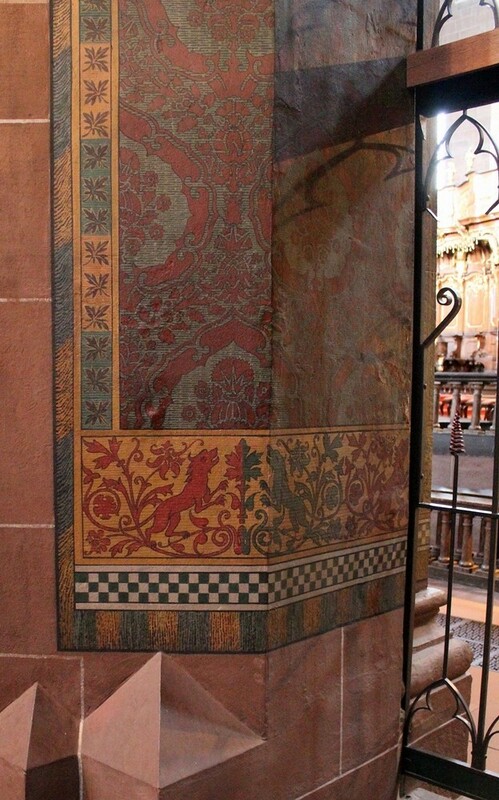 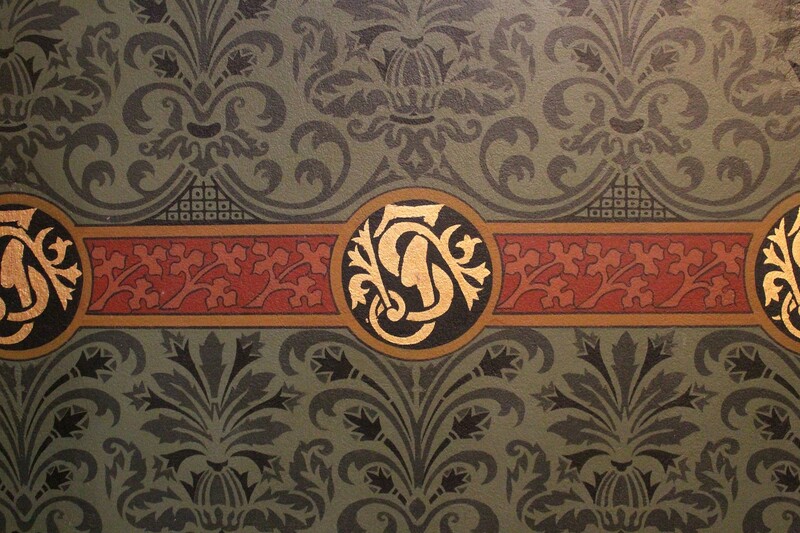 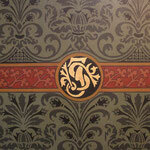 ... and colorful mural paintings. 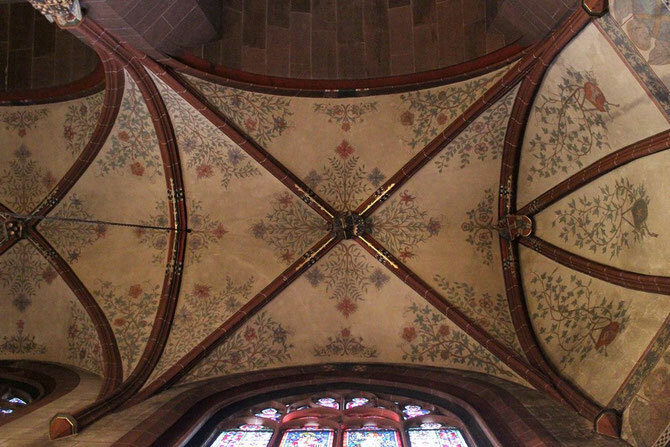 Of course the ceiling is painted too. 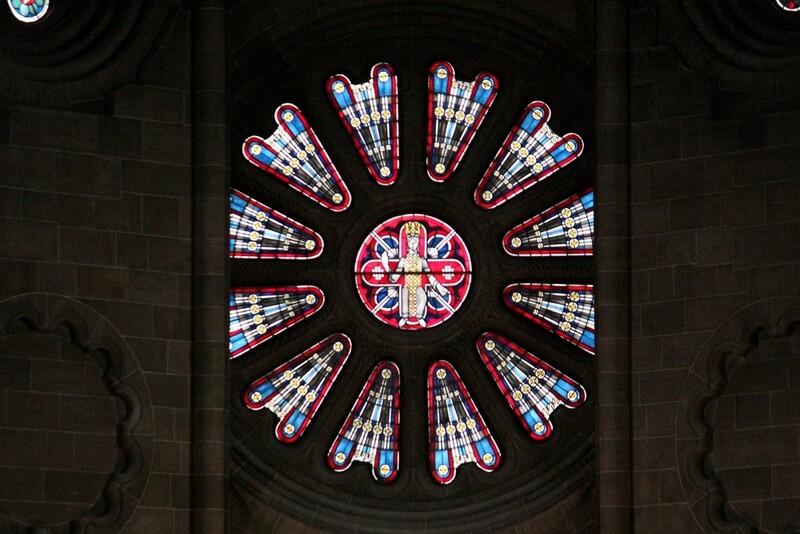 The stained glass rose windows above the west choir are incredibly detailed. 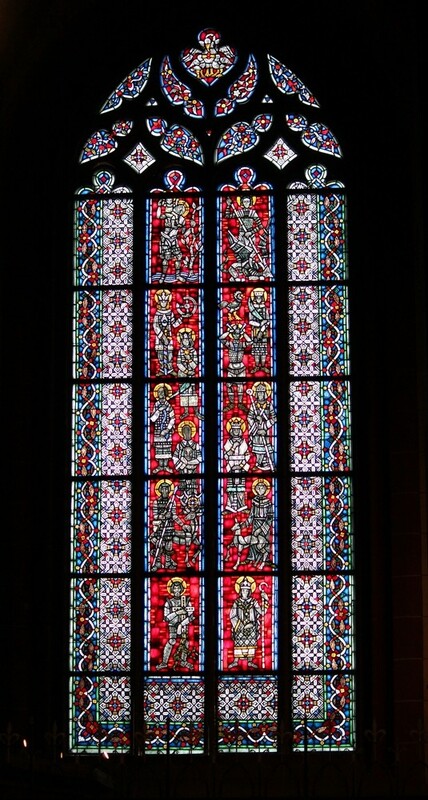 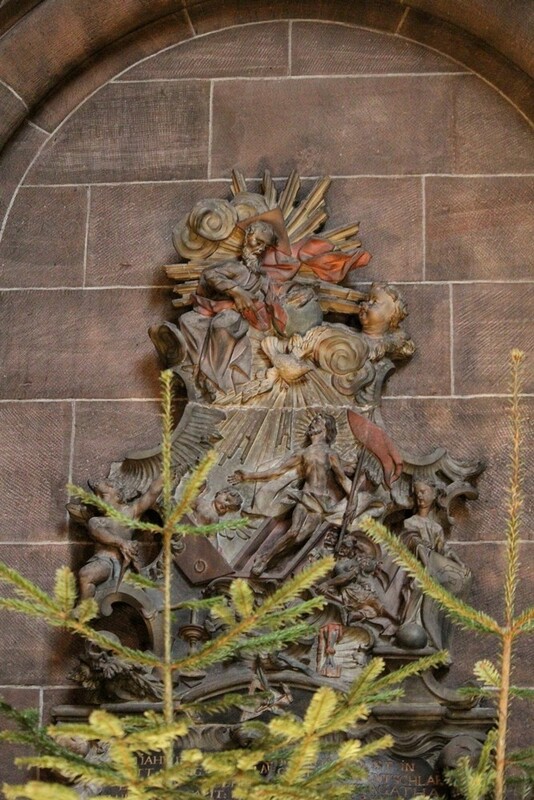 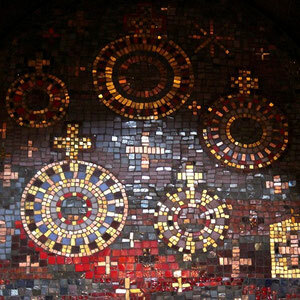 The original ones were destroyed during a bombing in 1943 and were restored between 1965 to 1995 by Mainz artist Alois Plum. 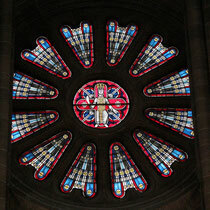 An interesting fact is that the main window seems larger on the outside than on the inside of the cathedral. 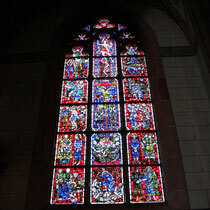 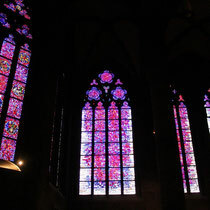 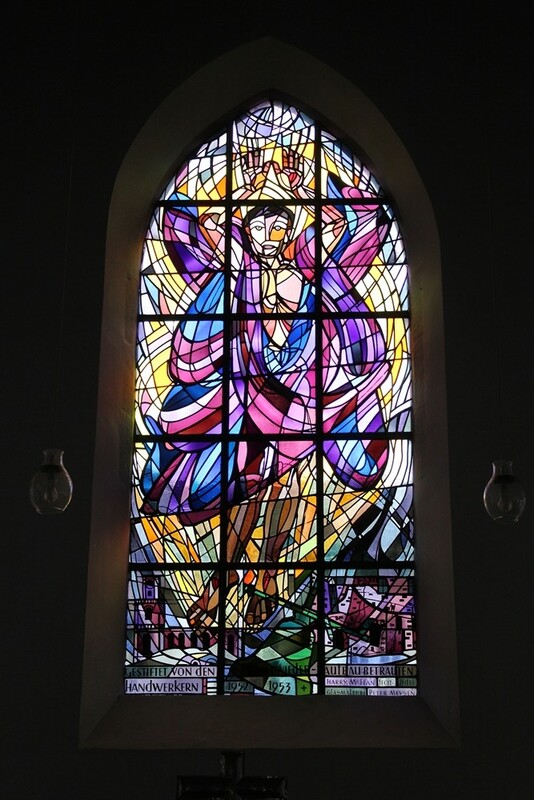 Of course the other stained glass windows are a sight to see too in all their glorious detail. 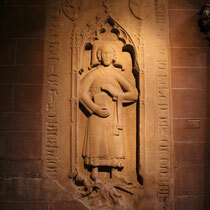 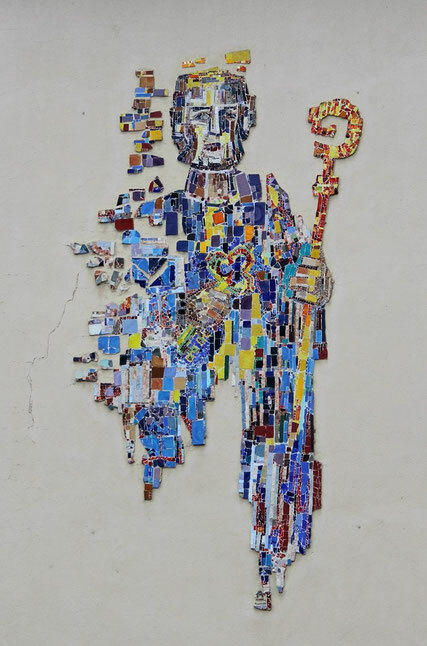 There is a multitude of mural reliefs along the walls of the cathedral. 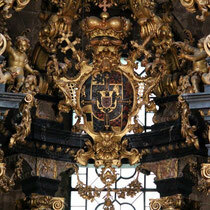 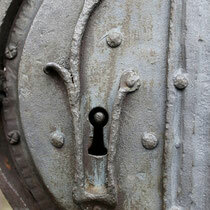 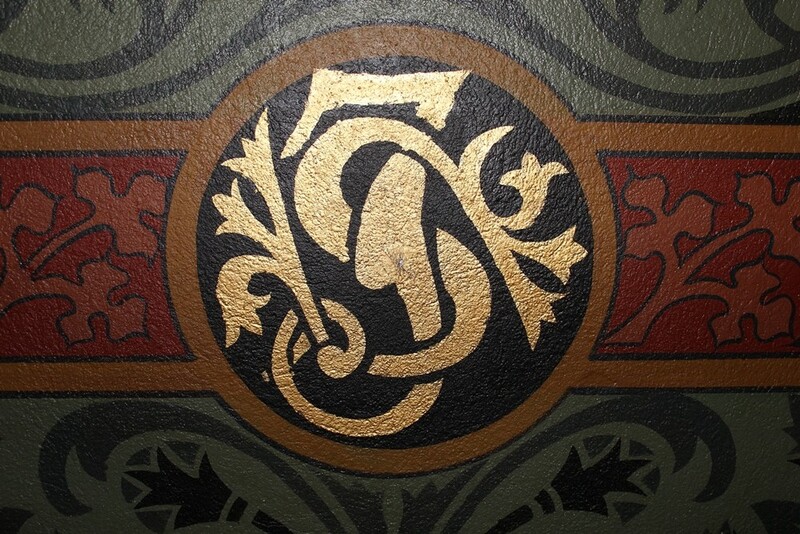 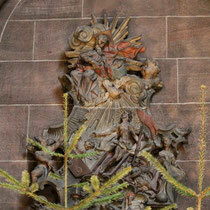 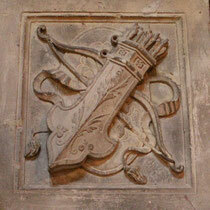 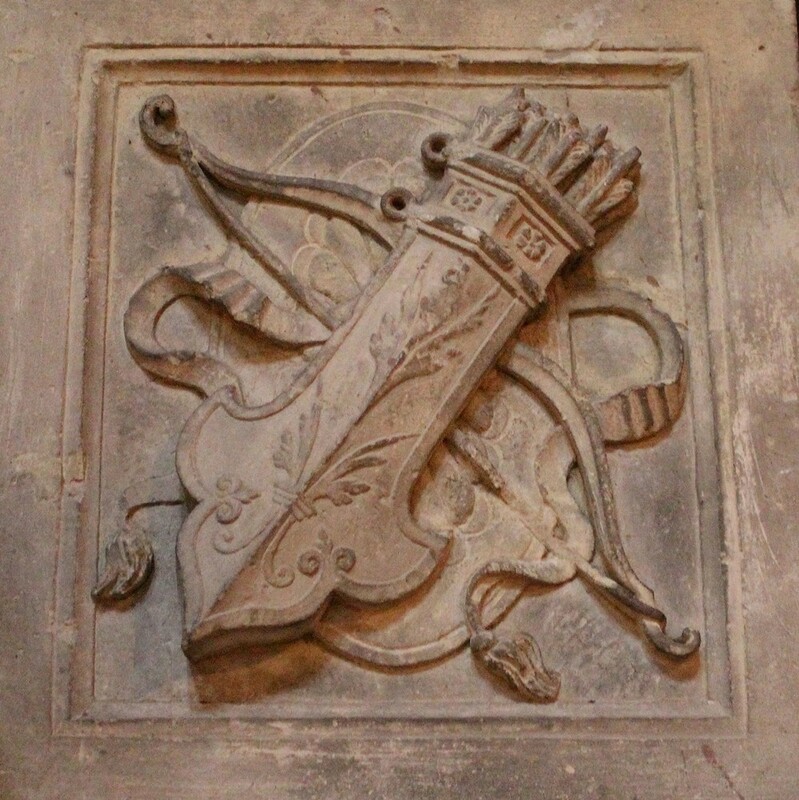 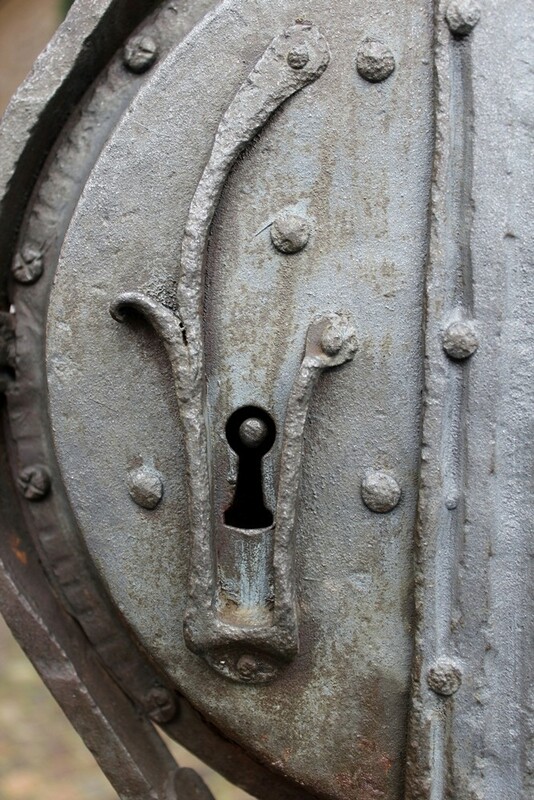 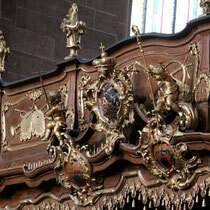 Some of them are even more elaborate and depicts coats of arms or inscriptions. 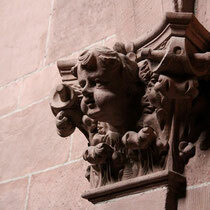 There are also many statues that are amazingly detailed. 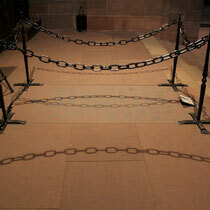 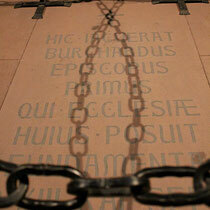 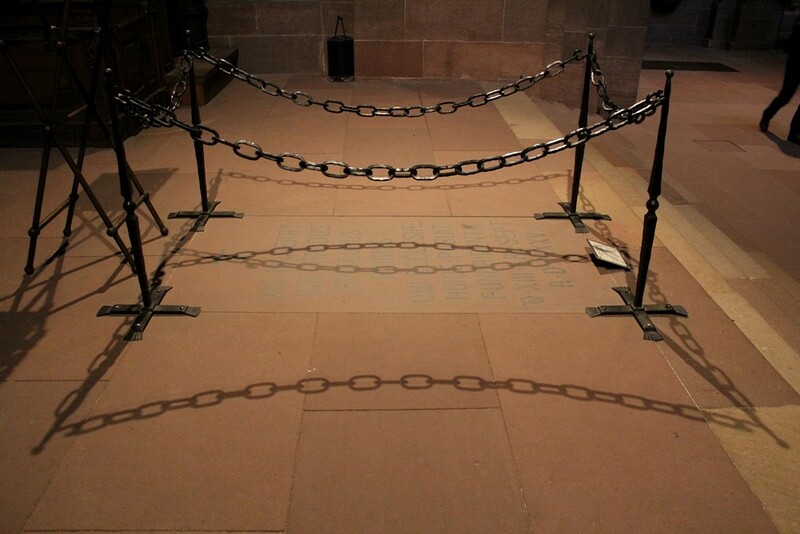 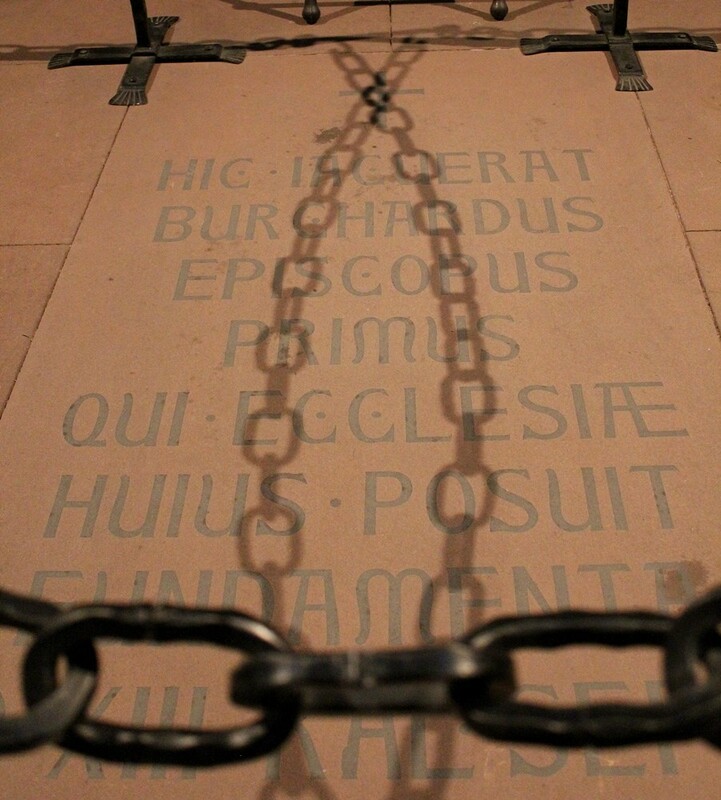 In front of the west choir was this chained off section with an inscription on the floor. 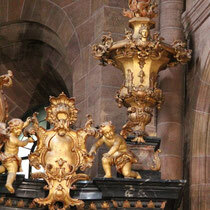 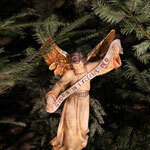 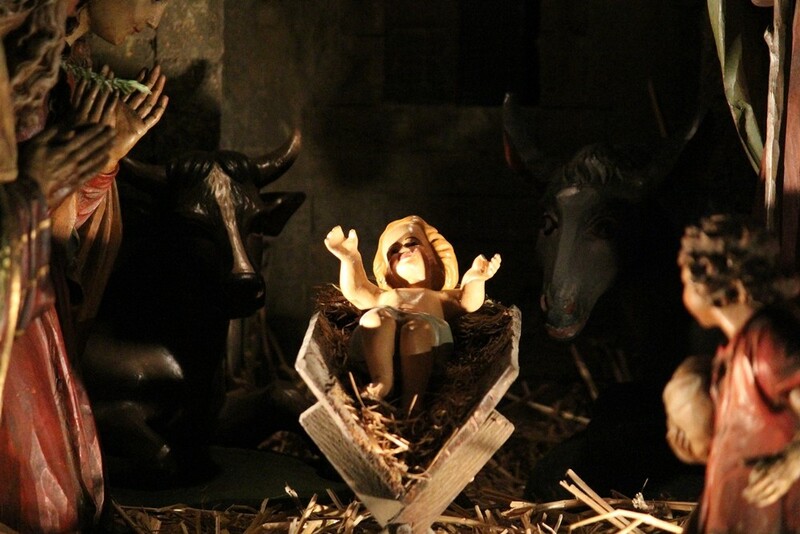 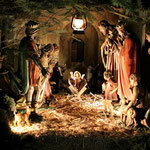 Within the west choir itself there was still the nativity scene from Christmas. 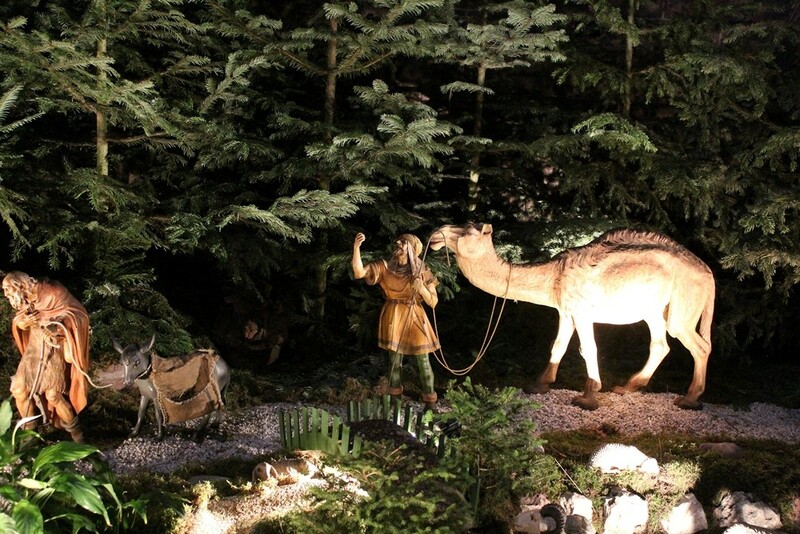 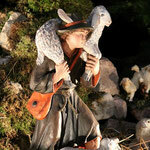 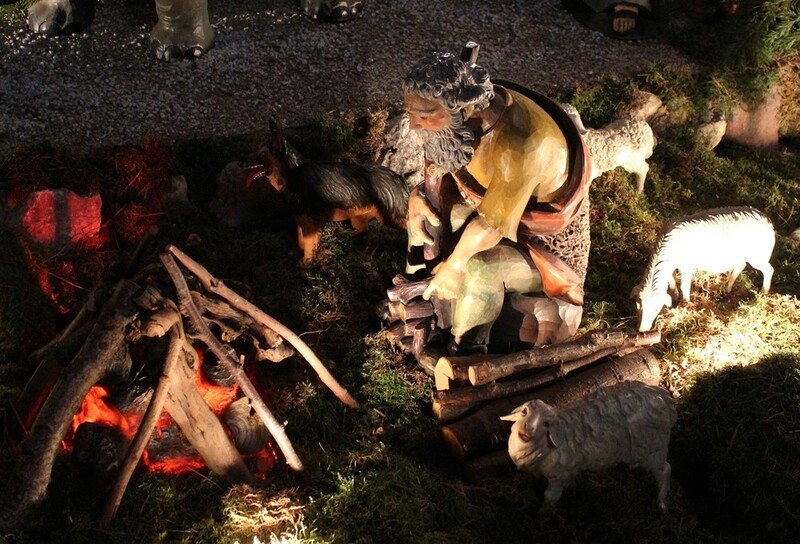 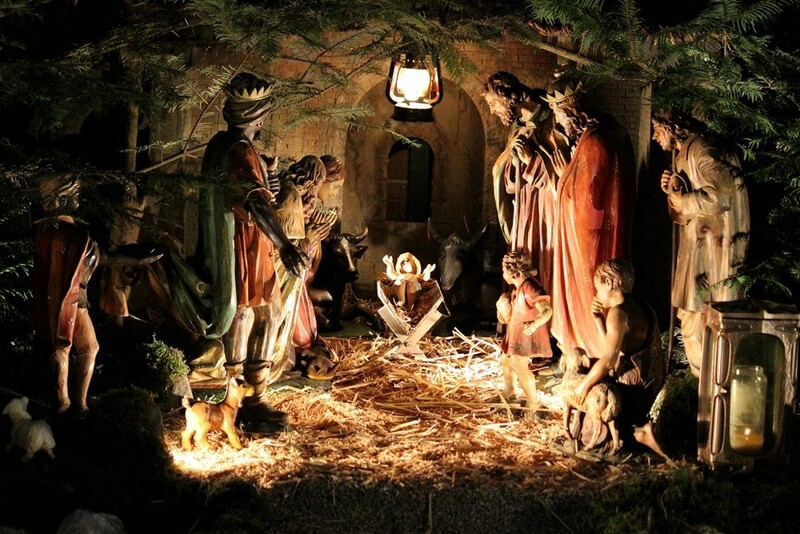 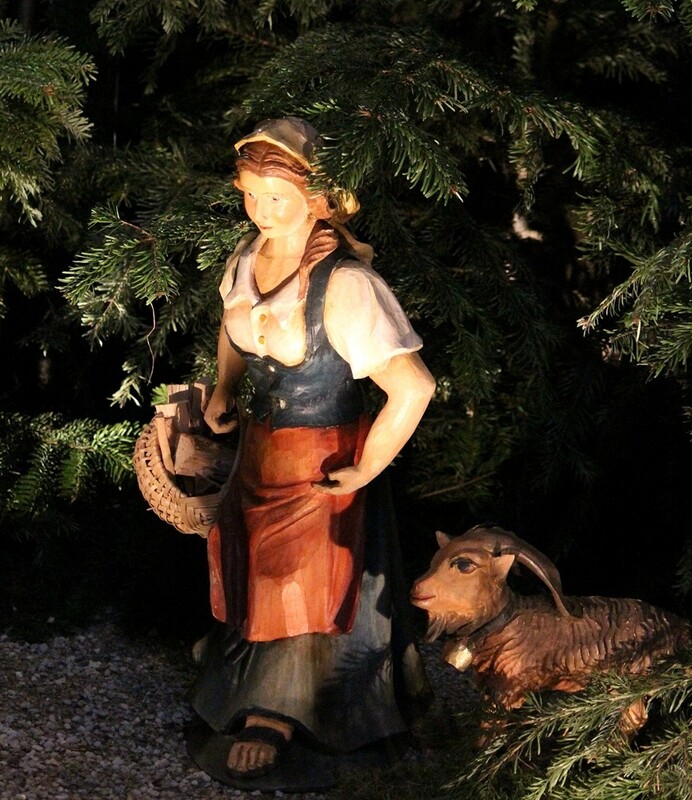 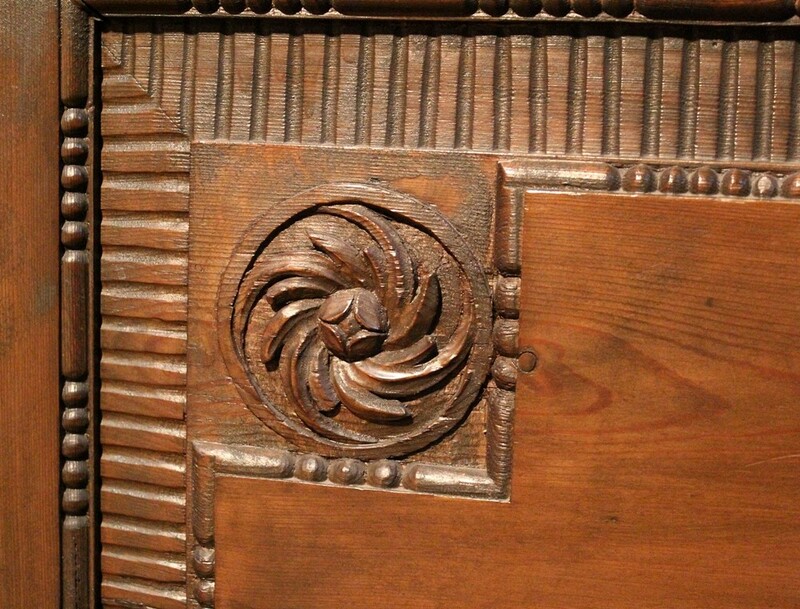 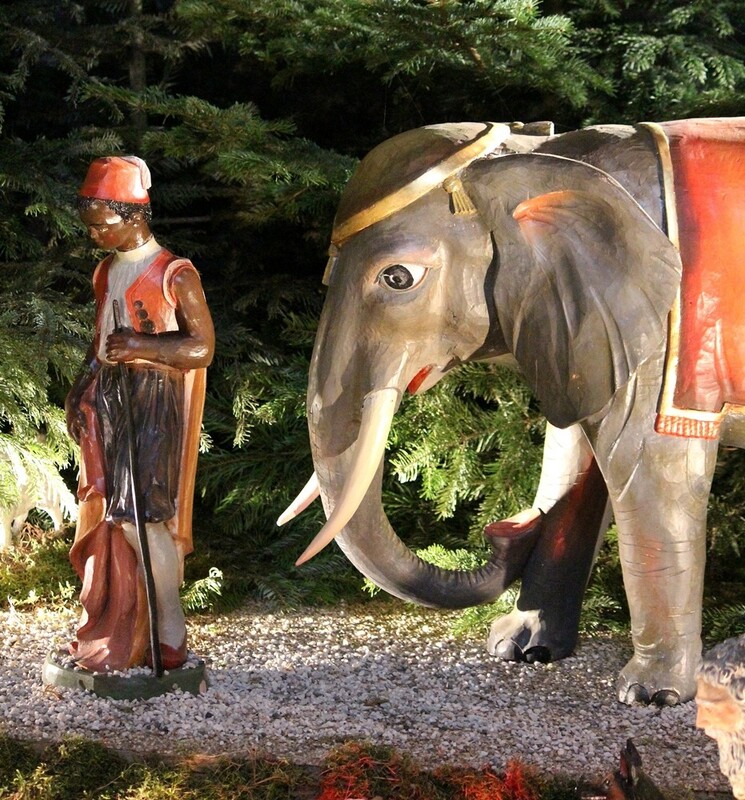 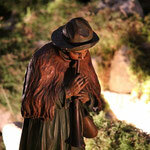 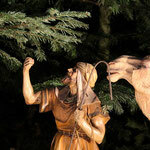 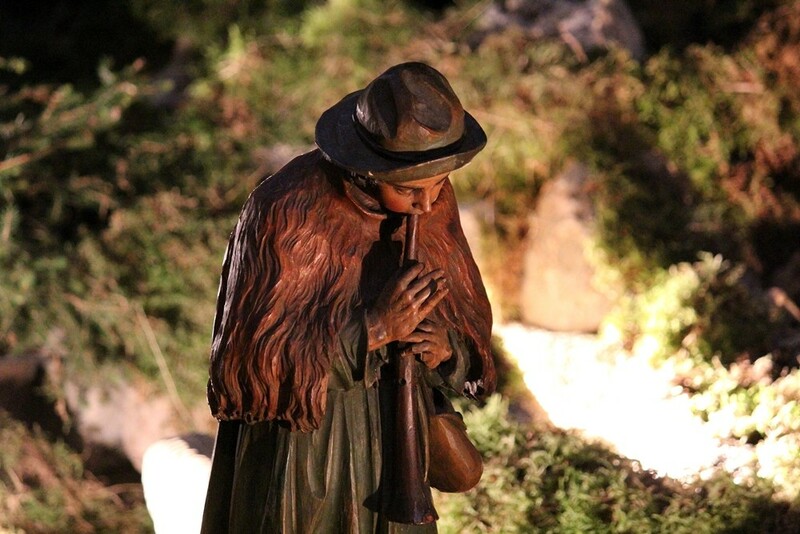 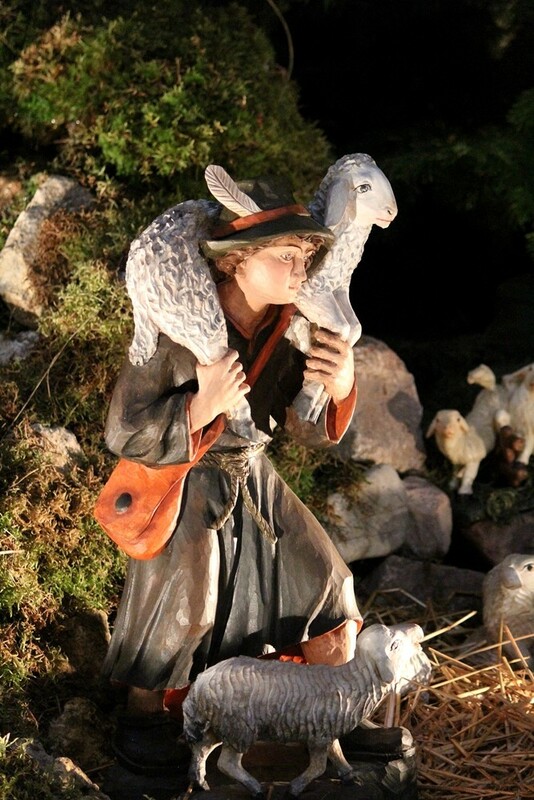 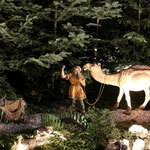 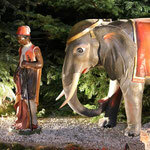 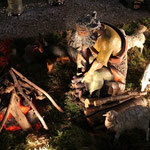 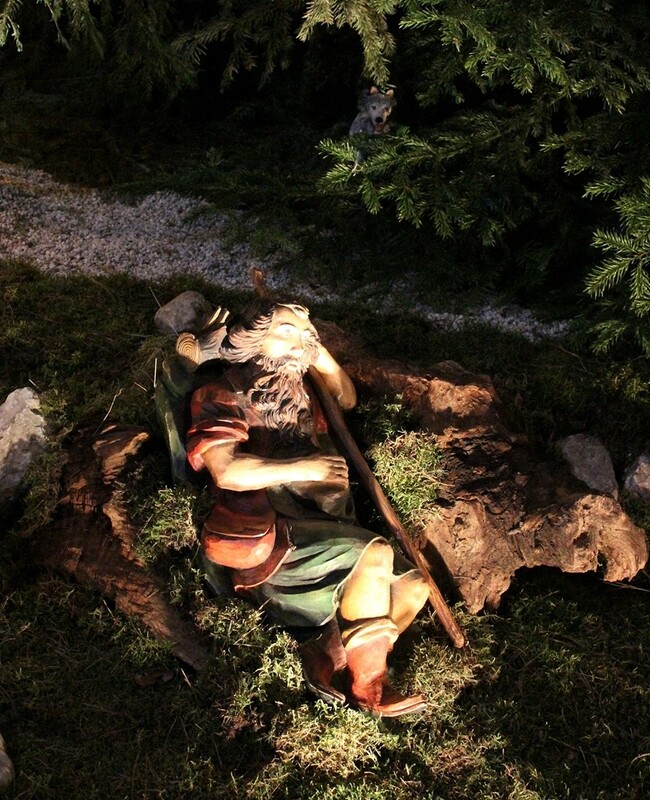 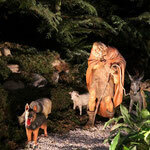 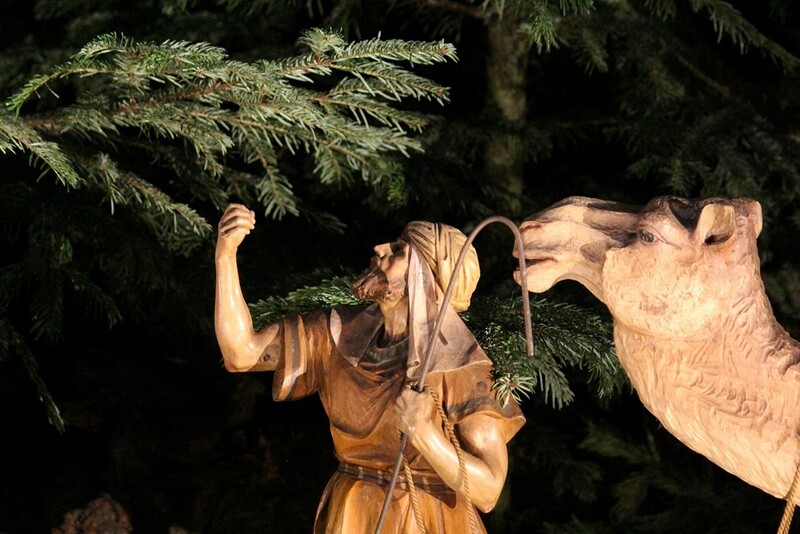 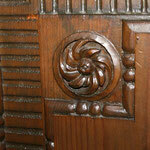 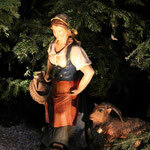 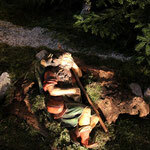 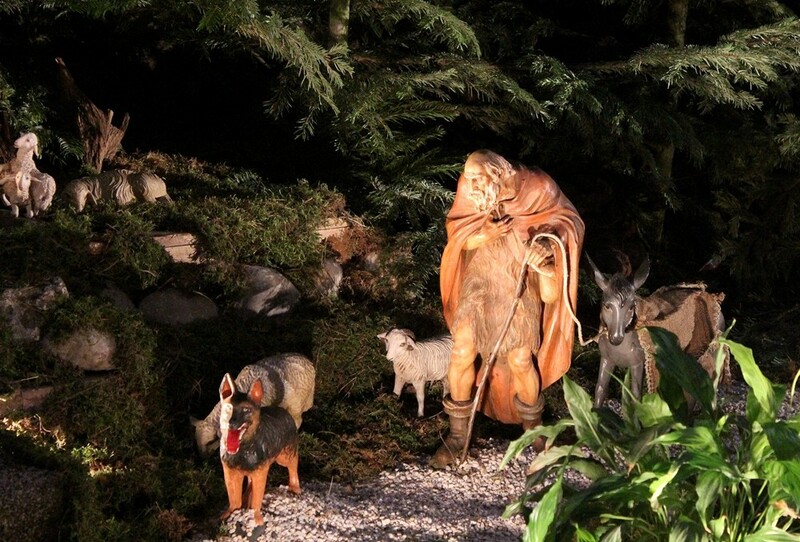 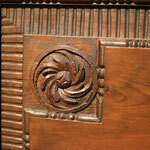 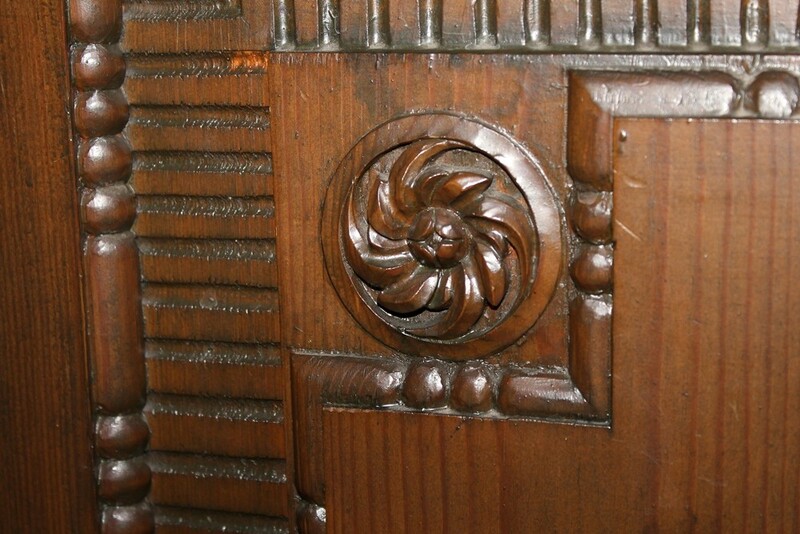 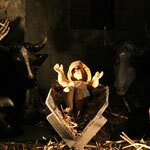 The carved wooden figures that populate the scene are made with an amazing attention to detail. 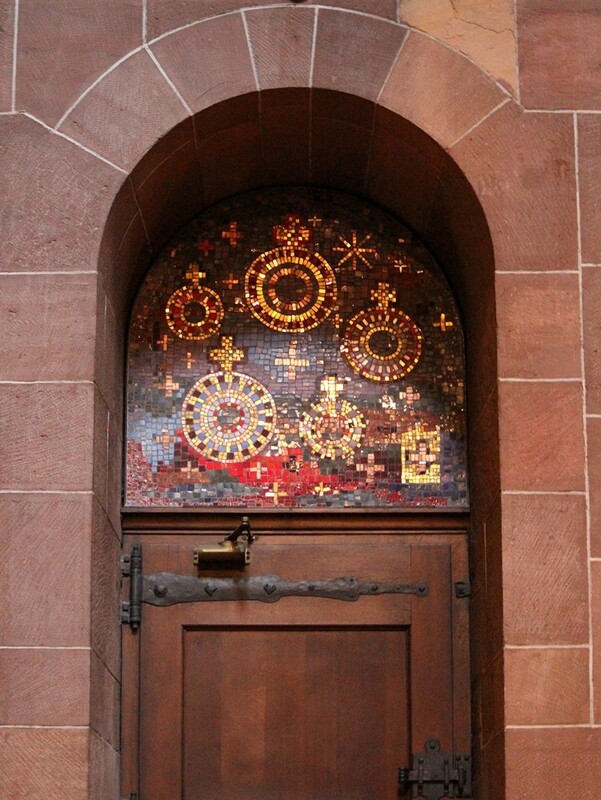 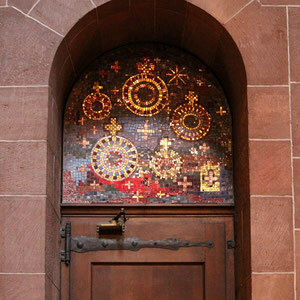 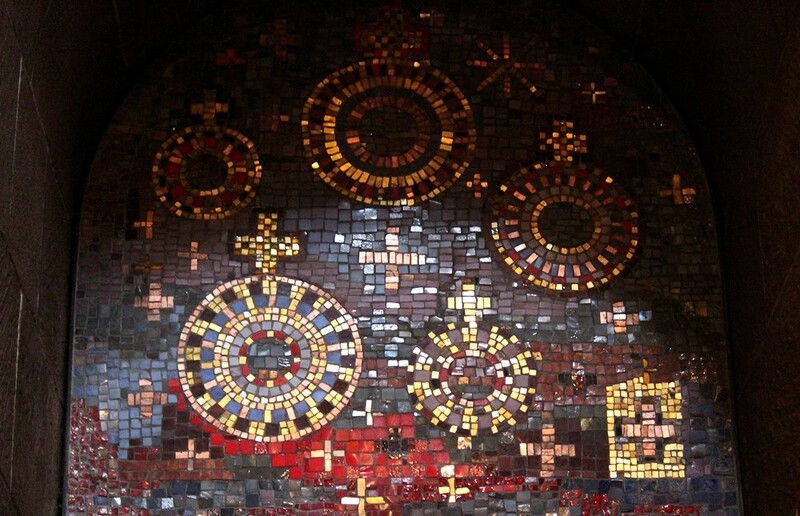 Near the west choir there is a door with a colorful mosaic above its frame. 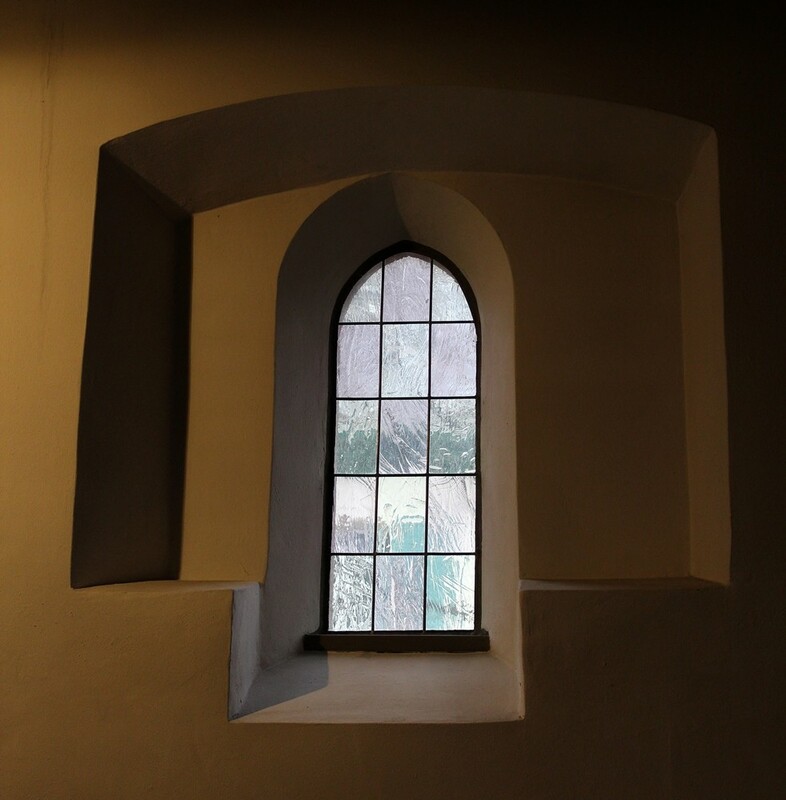 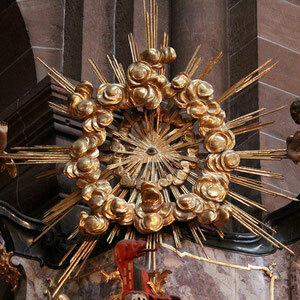 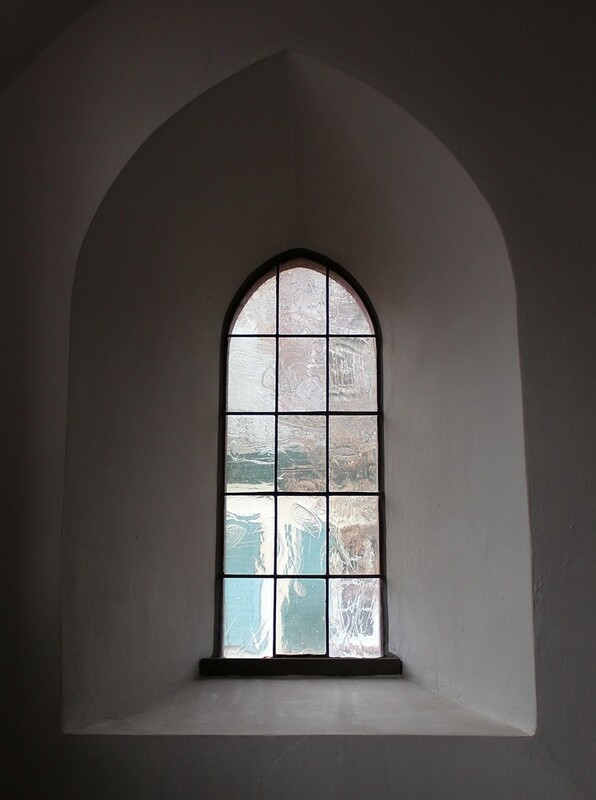 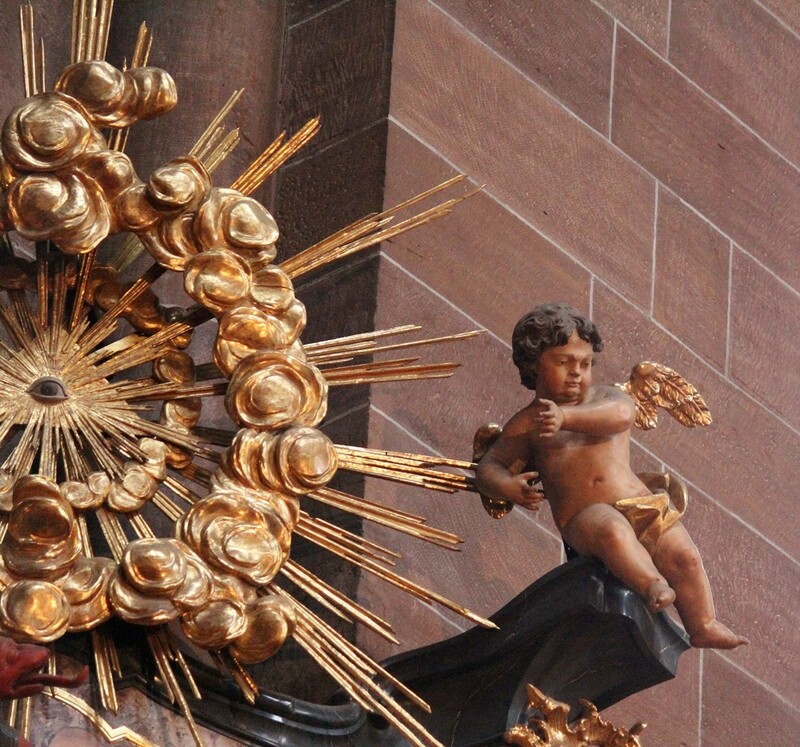 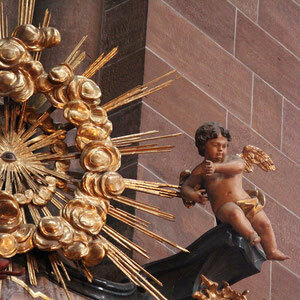 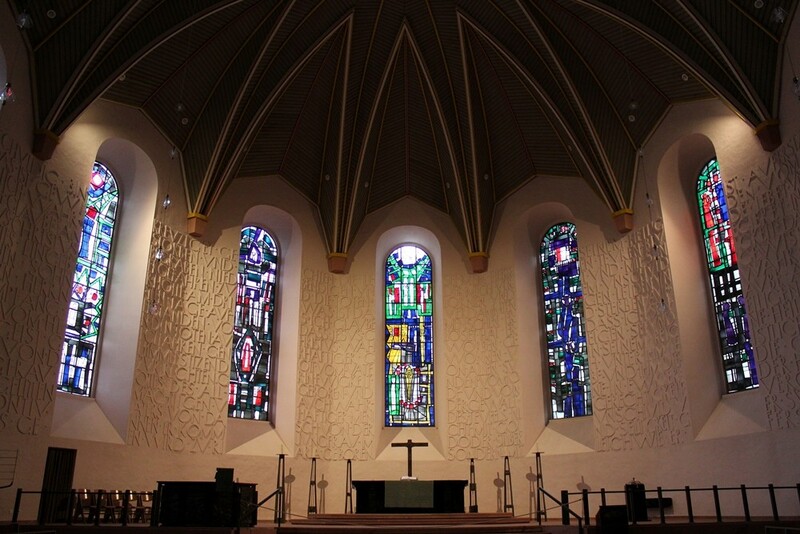 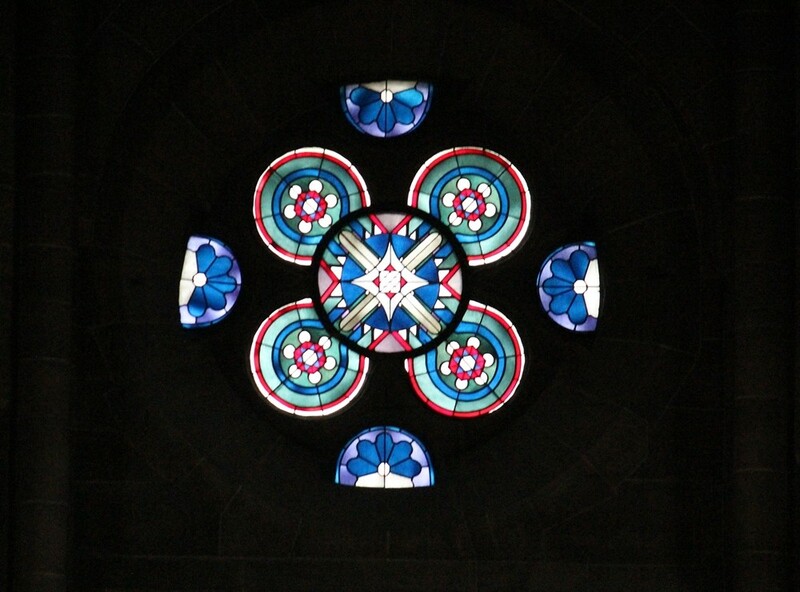 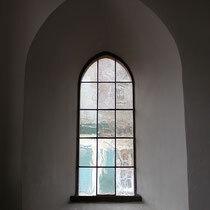 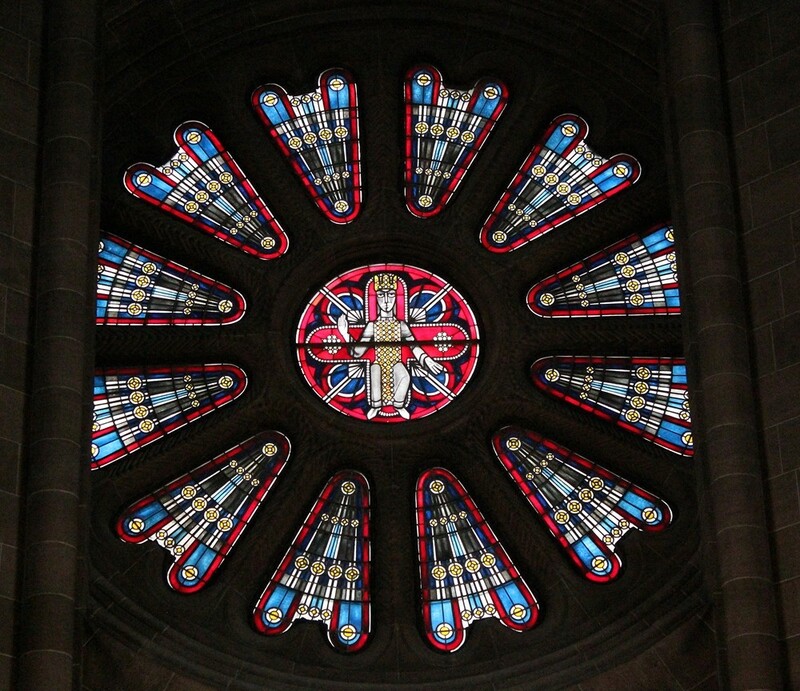 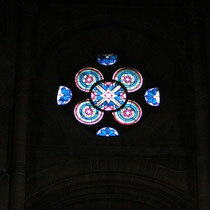 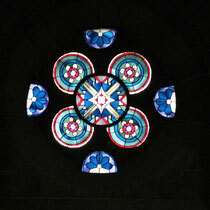 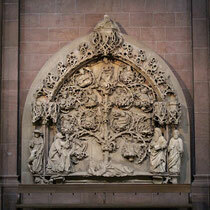 Close-by is a beautiful model of the rose window. 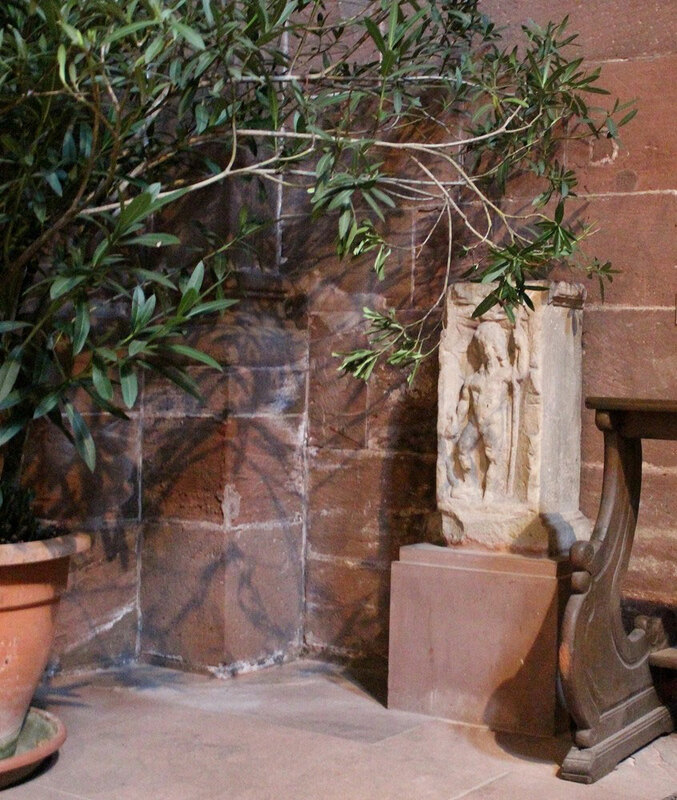 Off the south aisle is the Chapel of St. Nicholas. 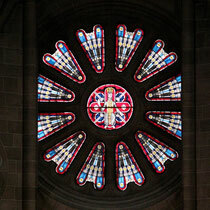 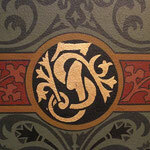 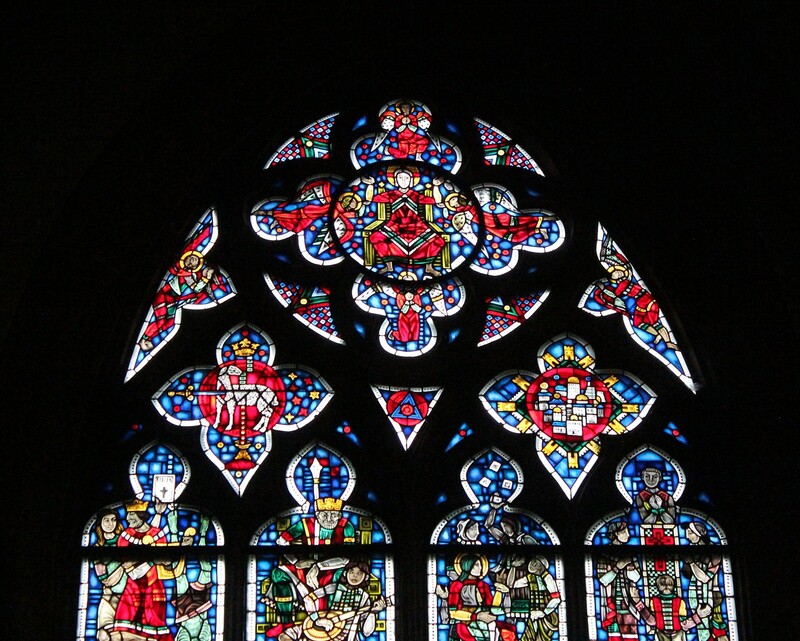 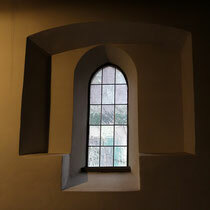 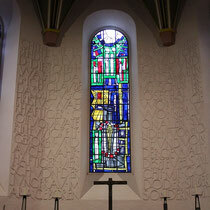 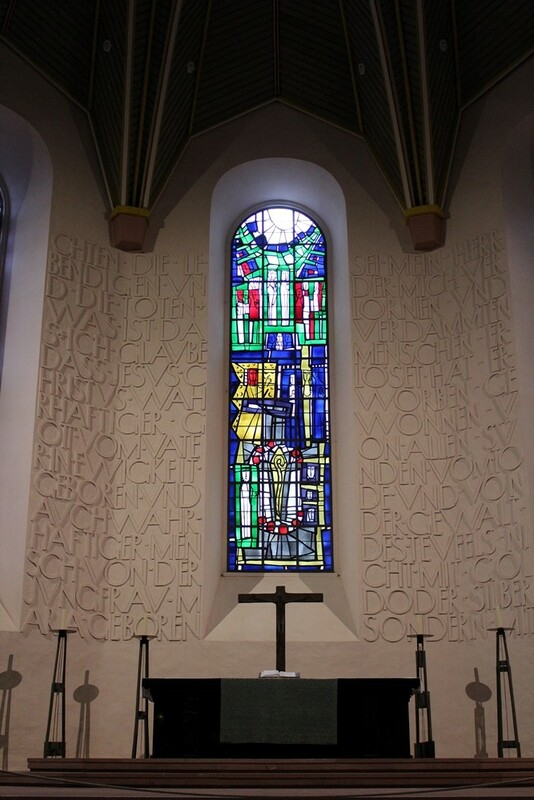 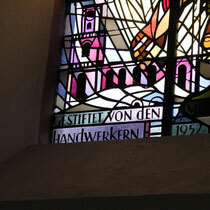 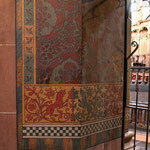 Inside there are beautifully stained glass windows and a sandstone font. 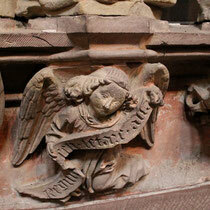 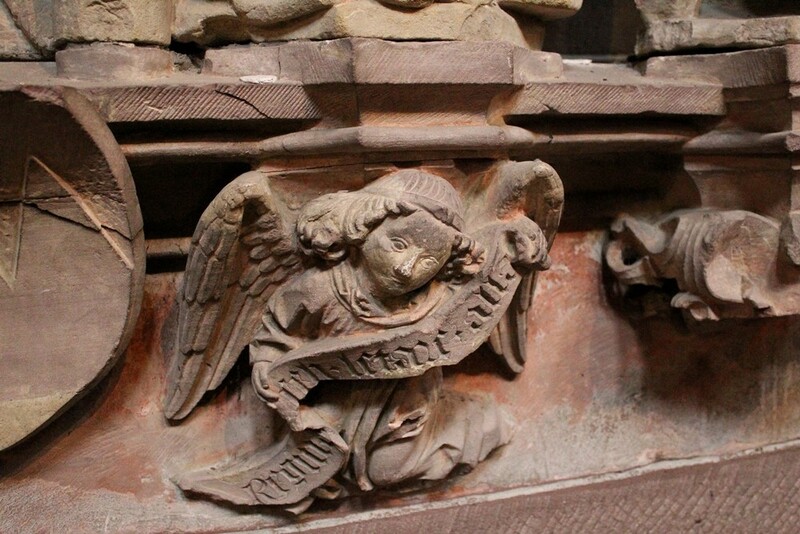 In a corner of the cathedral stood - half hidden - a Roman altar stone. 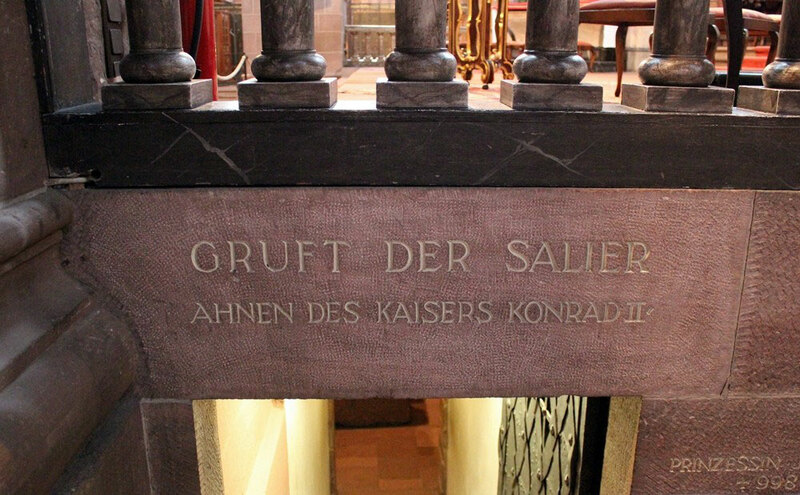 The crypt of the cathederal is the final resting place of Conrad I (Duke of Carinthia); Conrad II (Duke of Carinthia); Conrad (Duke of Lorraine); Henry of Speyer and Queen Matilda (consort of Henry I of France and daughter of Conrad II). 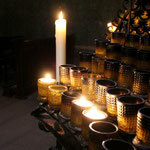 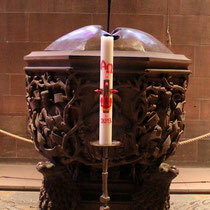 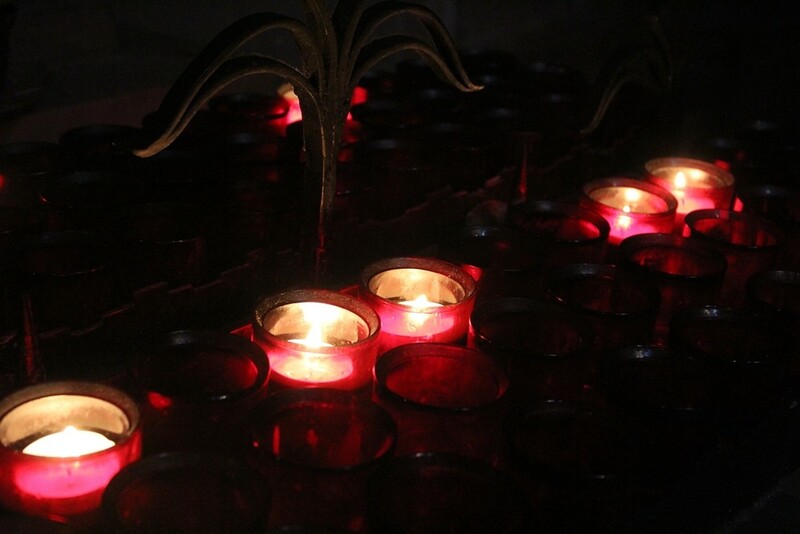 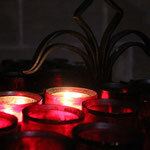 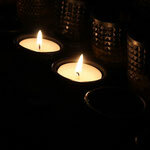 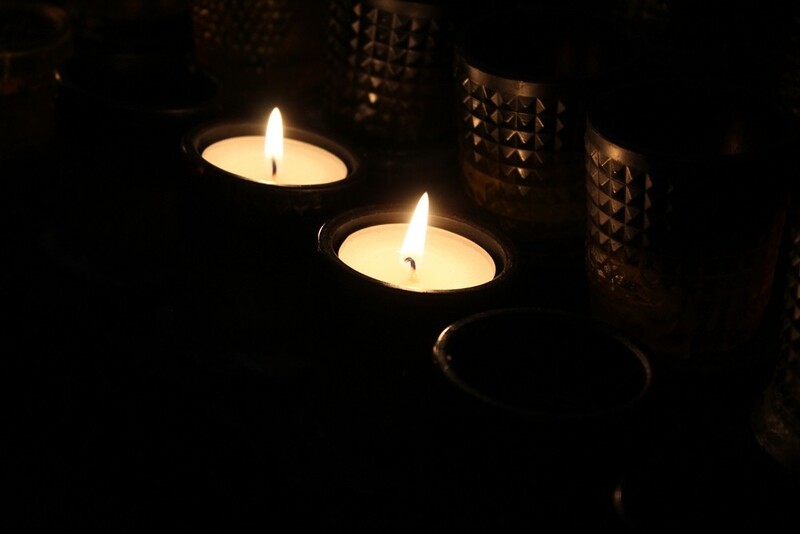 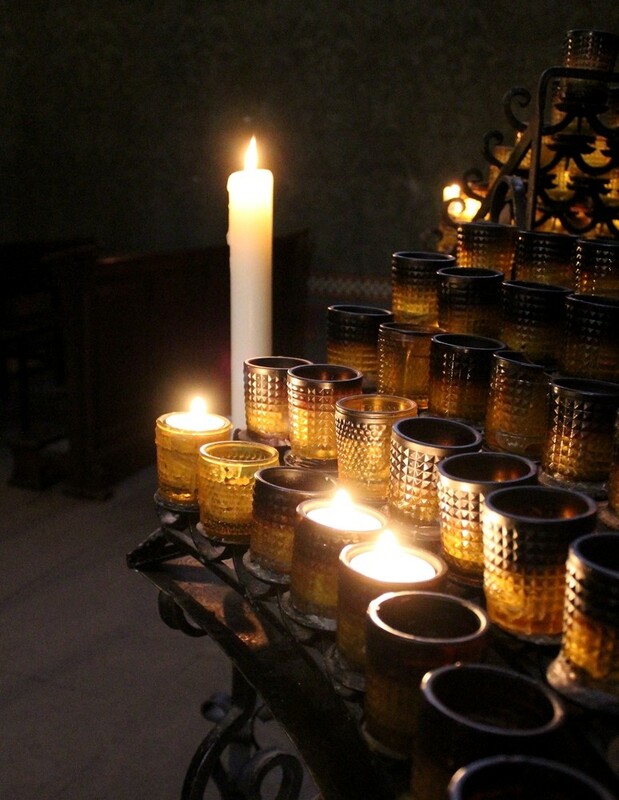 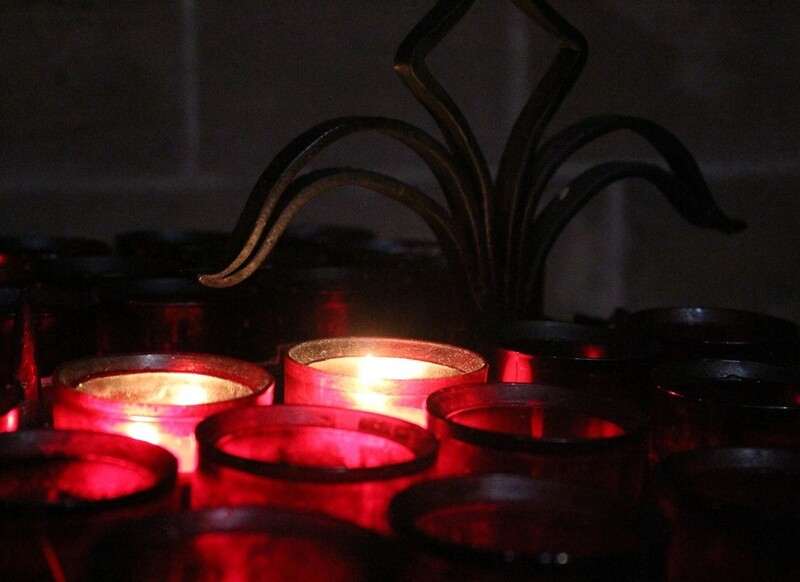 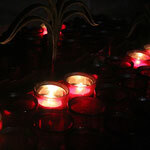 There are several places where you can light candles in exchange for a small donation. 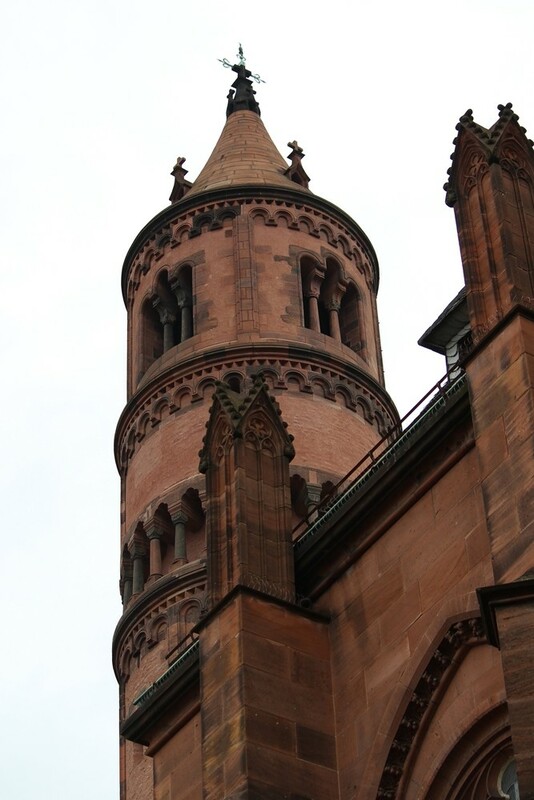 After leaving the cathedral I looked around its exterior for a bit, before going for a little walk towards the museum of Worms. 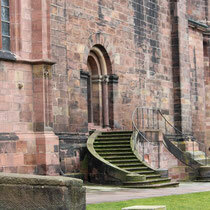 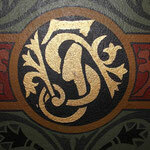 Just down the cathedral's steps there is a house with this beautiful mural painting. 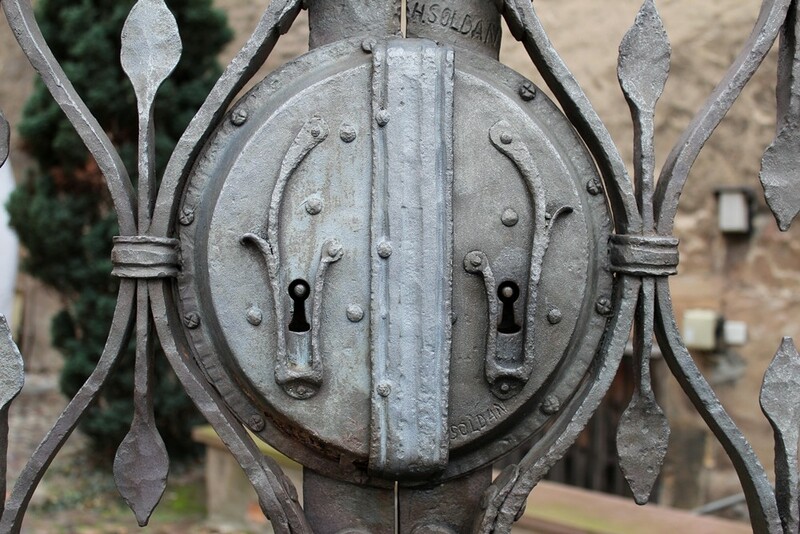 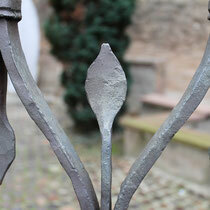 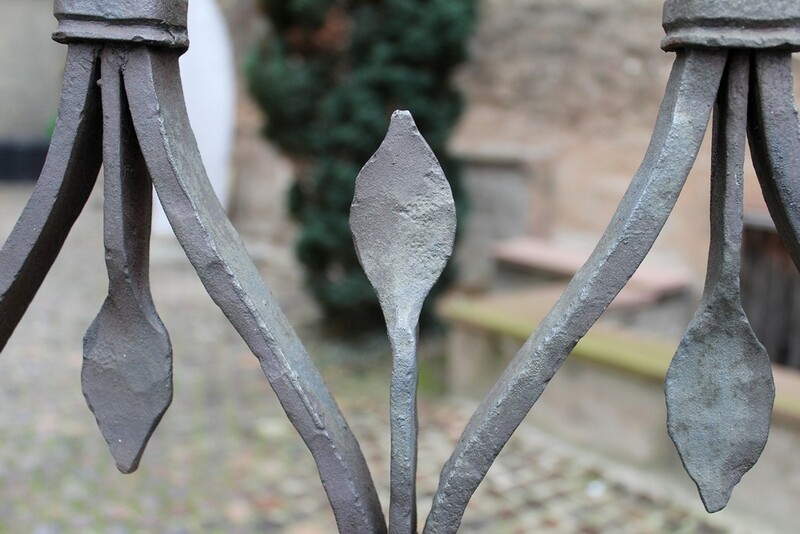 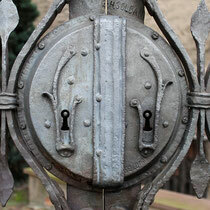 Along the way I came across this gate made of wrought iron. 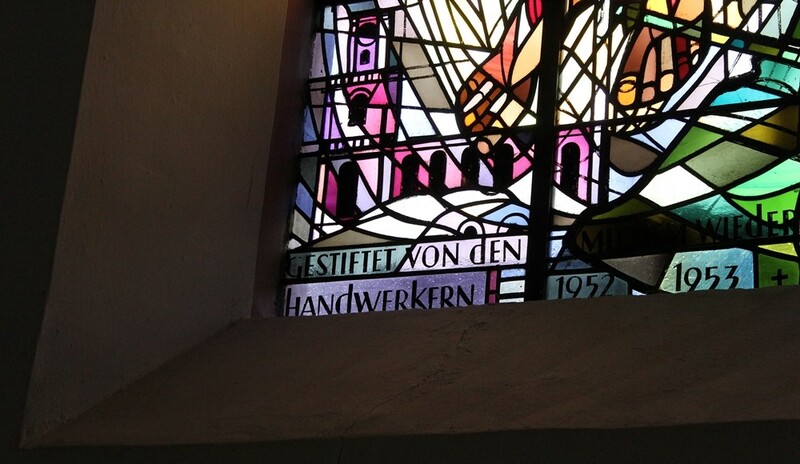 In a small church I found another beautiful stained glass window - this one not really old though as you can tell by the inscription. 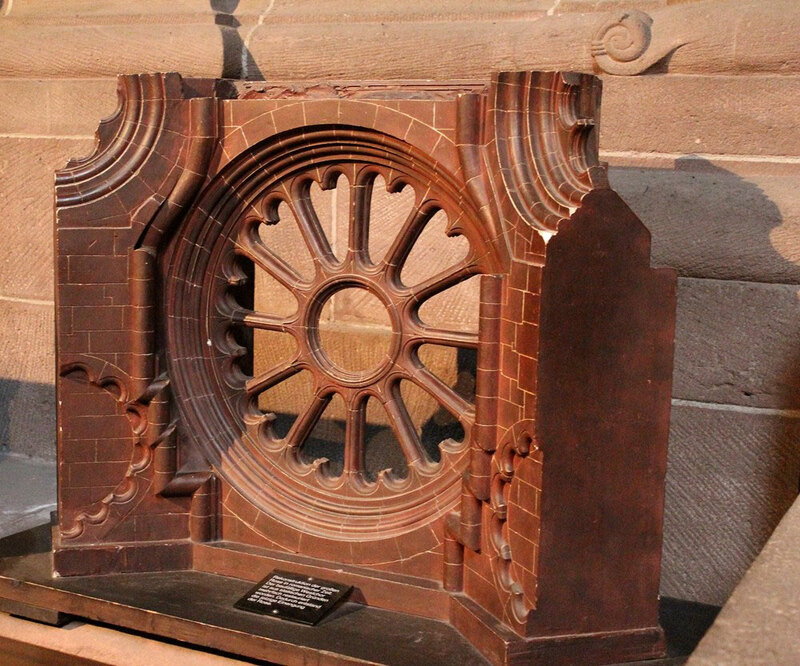 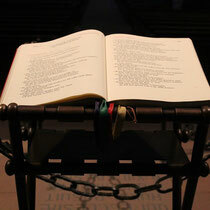 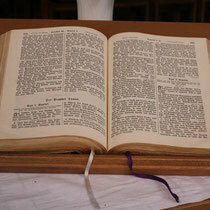 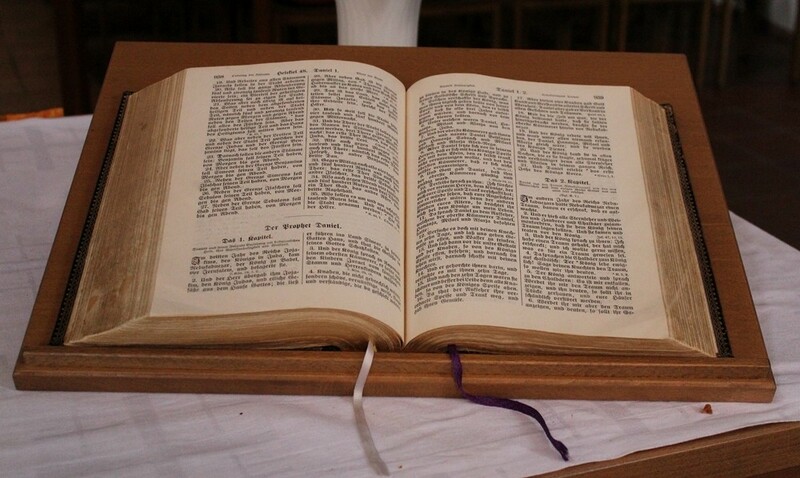 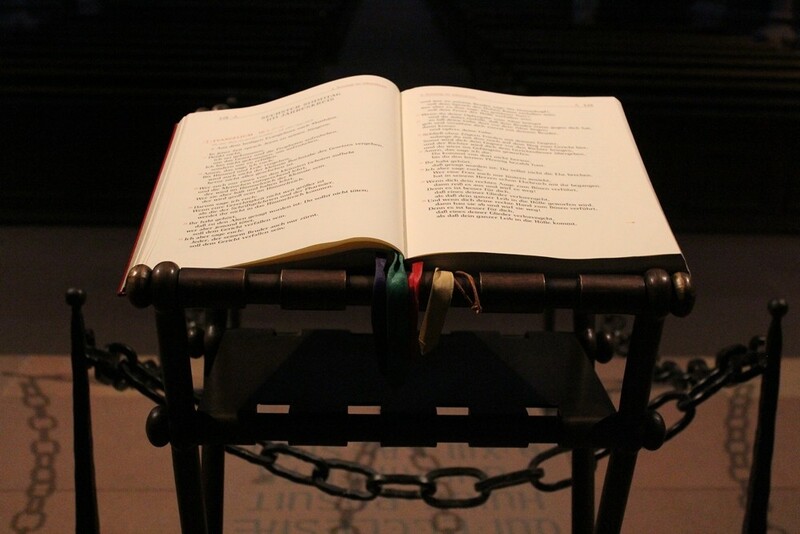 There was also a bible on the altar that invited visitors to read in it, the imprint of a cross in sandstone and two nice gothic windows that were set into the wall. 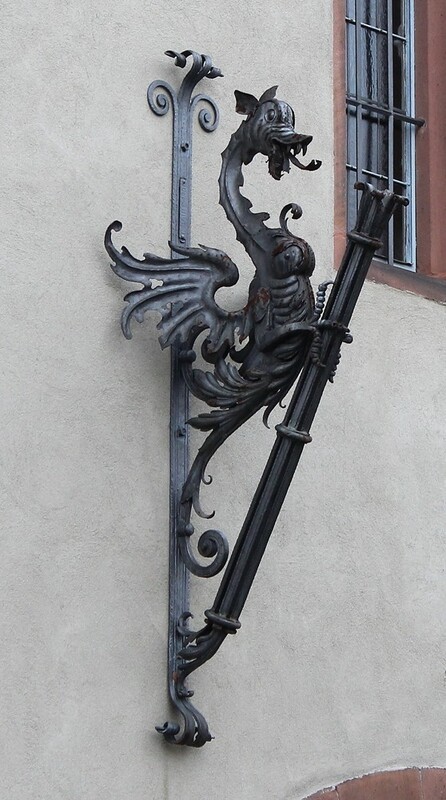 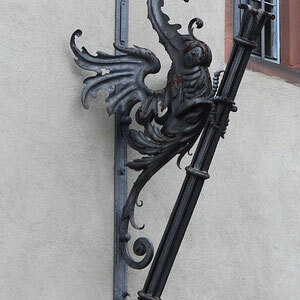 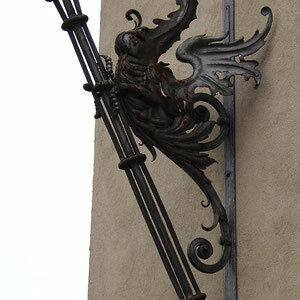 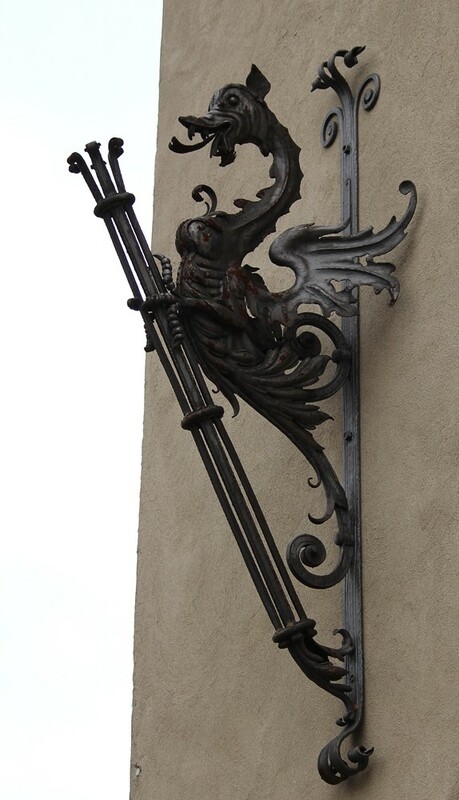 On the wall of the museum of Worms was this dragon sculpture. 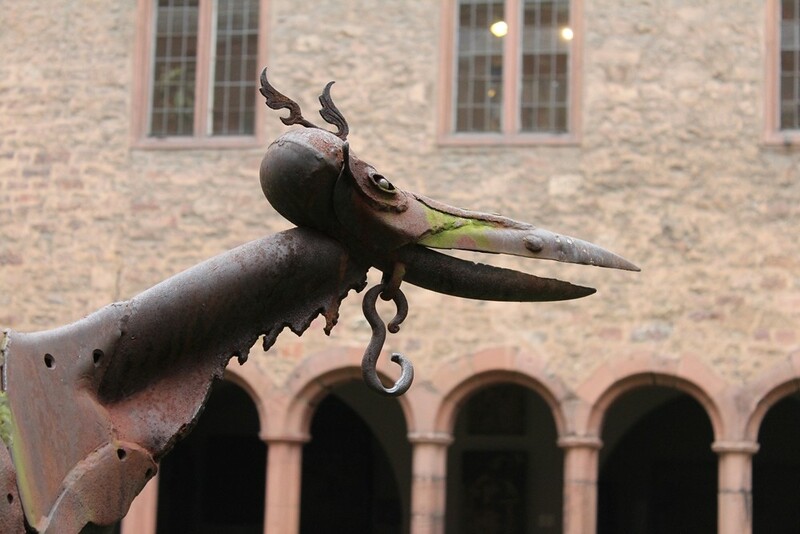 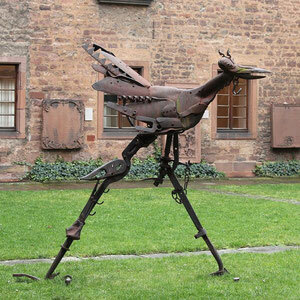 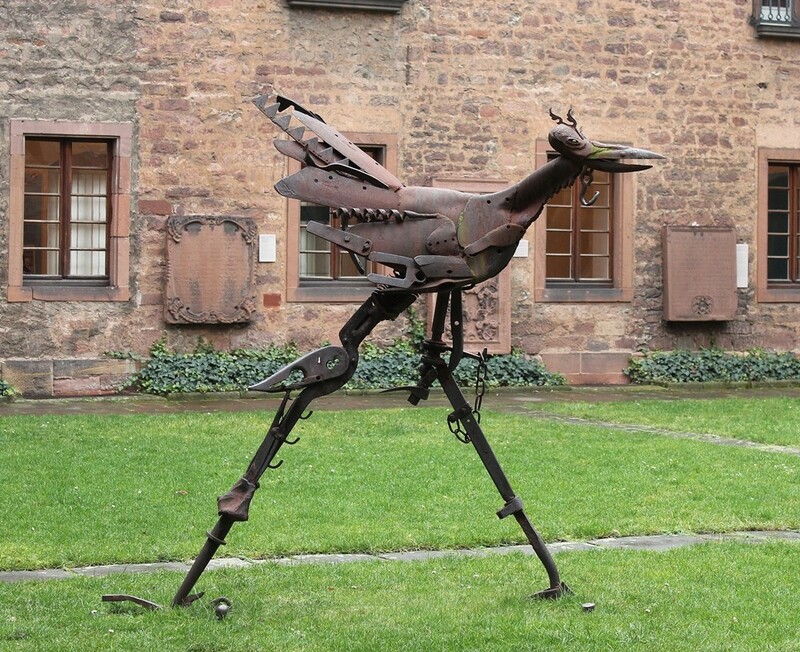 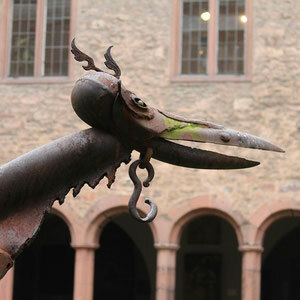 In the courtyard of the museum stood this weird bird made of rusty metal. 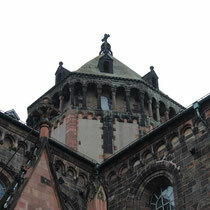 I ended up not visiting the museum today. 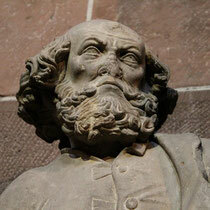 I will postpone that to some other day. 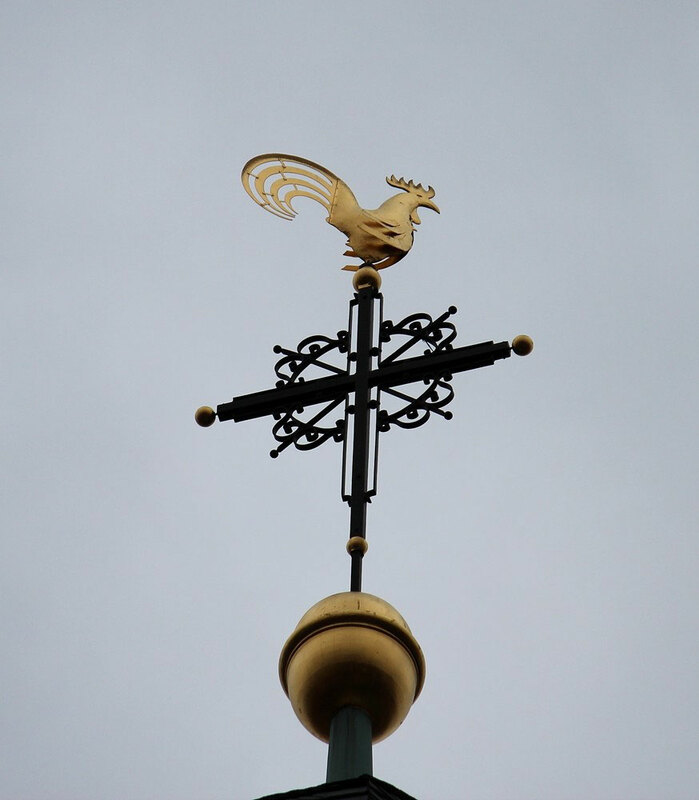 On my way back this weather vane caught my attention. 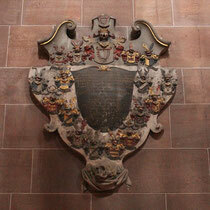 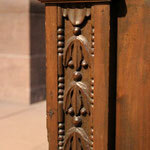 As it turned out it belongs to the Trinity Church. 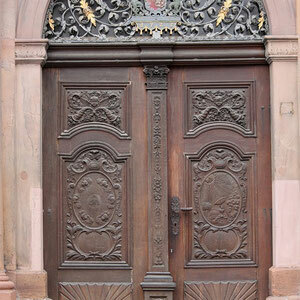 The beautiful entrance to the church. 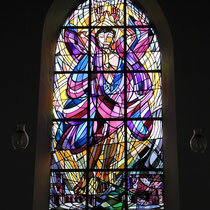 More stained glass and a mural relief inside. 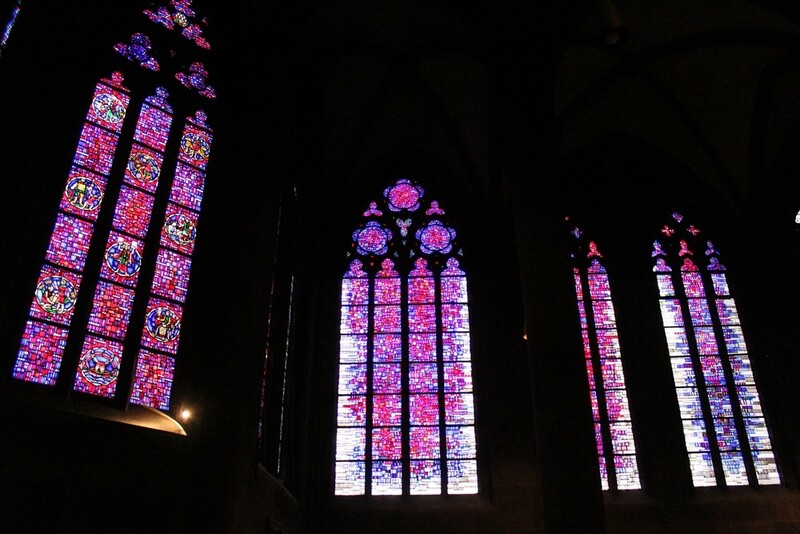 And this was the proper end for today's tour.